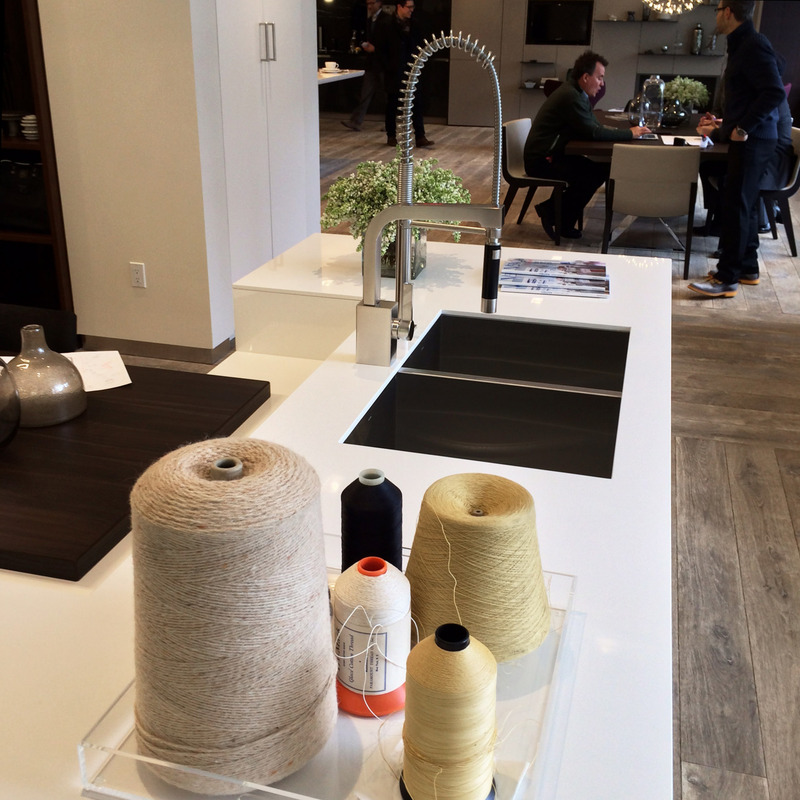 On Saturday, May 21 Pirch Soho opened at the corner of Lafayette and Broome in New York City. On Thursday, I attended the VIP opening party with the rest of the SieMatic and Fitch design teams. As long-time readers know, I have been designing the kitchen areas for the Pirch stores, and Soho is unquestionably our best. Here are some impressions of the finished store and the grand opening party. The buzz starts on your subway ride to Spring Street. Pirch has advertisements throughout the subway using celebrities in the decorating and gourmet arenas. The building itself is a fine old stone/brick manufacturing/office building, lovingly restored. The store itself covers 32000 square feet and actually comprises space from at least two buildings, as the grade change and brick arches inside reveal. The exterior brickwork and paint is exceptional. Approaching the store after 6pm, guests experienced a velvet rope line up the block and tuxedo-clad “security”. Yes, quite the buzz. Above is the view upon entry; SieMatic is the very first thing you see, even before the standard Pirch complimentary cafe. 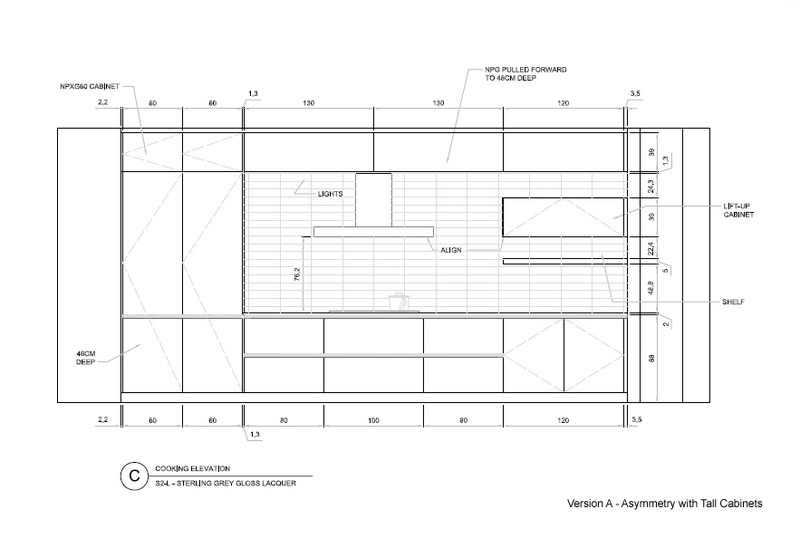 SieMatic was very fortunate to get involved with the store layout early in the design process. We were able to implement SieMatic’s vision of Timeless Elegance and Journey of Discovery by ensuring lots of space around each kitchen environment and letting the architecture inspire our layouts and material choices. This first display features Gaggenau appliances, with a freezer and refrigerator clad with Black Oak veneer and the balance of the cabinets in Agate Grey matte lacquer. 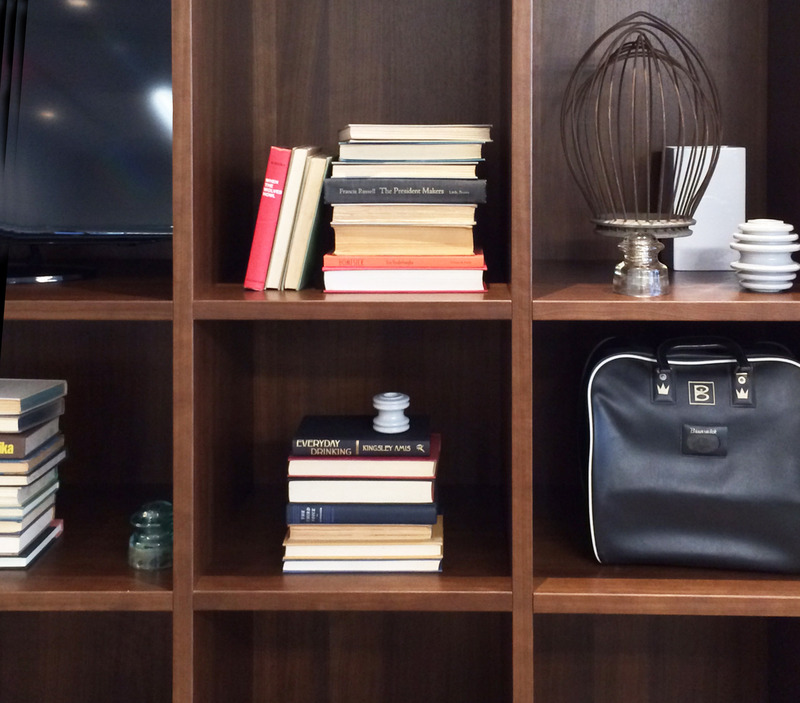 The open layout and floating shelves are minimal and contribute to the spacious feel. As one walks throughout the space new display environments reveal themselves around wall blocks and glass screen walls. As they were setting up for the party, some of the larger areas were dominated by catering and DJ equipment so this shows only a portion of what is on offer. Appliances on display include Sub Zero, Wolf, Viking, Miele, Gaggenau, Monogram … essentially the best available in the market today. SieMatic’s new 3003 door features a very thin 6.5mm edge detail in matte Nutmeg lacquer. We mixed a very subtle aged bronze accent color into this display, as seen on the handles. Up front we show another 3003 in Graphite lacquer, this one featuring Miele appliances and stainless steel accents. Realistic seating areas are included where we could fit them, as this completes the domestic feel but also these areas are where the Pirch and SieMatic customer consultations start as guests receive exceptional and personalized service when shopping at Pirch. The Miele display is tucked into the window on the Broome side of the store, shown behind the stair area below. This little display may not be much in size but when customers explore each area of the store little surprises like this small kitchen area come to life. Pirch offers kitchens, bathrooms and outdoor living furniture and fixtures. A view to a bath environment on the second floor shows how the store designers (Fitch of Columbus OH) aimed to show complete environments in the design. Note – all faucets and bath fillers and shower heads are fully functional for a very realistic experience. The spaces on the second floor are more intimate due to a lower ceiling and window height. We responded to this feature by making the kitchen areas smaller and more realistic by building them in with walls and the ceilings properly. This “Innovation Loft” kitchen takes up the corner of the second floor and is part of an apartment suite. There are many home-organization and entertainment media screens embedded into the design like in the table and on top of the counter top. The loft is fairly small so a good view of this area was a bit hard to capture properly. I didn’t venture upstairs during the party to see how this area was received but I’ll pop-up to NY occasionally to see how the store is doing “in action” and report back. We used as many new SieMatic features as we could, including these open shelves from the “URBAN” collection of furniture, quite appropriate to New York’s apartment-dwelling clientele. Marcia Speer of SieMatic poses with me for our obligatory party shot. Marcia and I work very close on these stores, selecting materials and shaping the overall product offering and interfacing with the Pirch team to get the mix of cabinets, counter tops and appliances just right. In addition we have a team of bright designers, managers and installation experts at SieMatic who help put the whole thing together – too many to note here but they know who they are and if reading this, please recognize that I cannot take any credit for this work without your invaluable help! Next up for Pirch and SieMatic is the exciting addition of Austin TX. We have almost completed this design and it should be open by early 2017. I know this latest store is the best for SieMatic and Pirch and I’m sure it will be a smashing success. 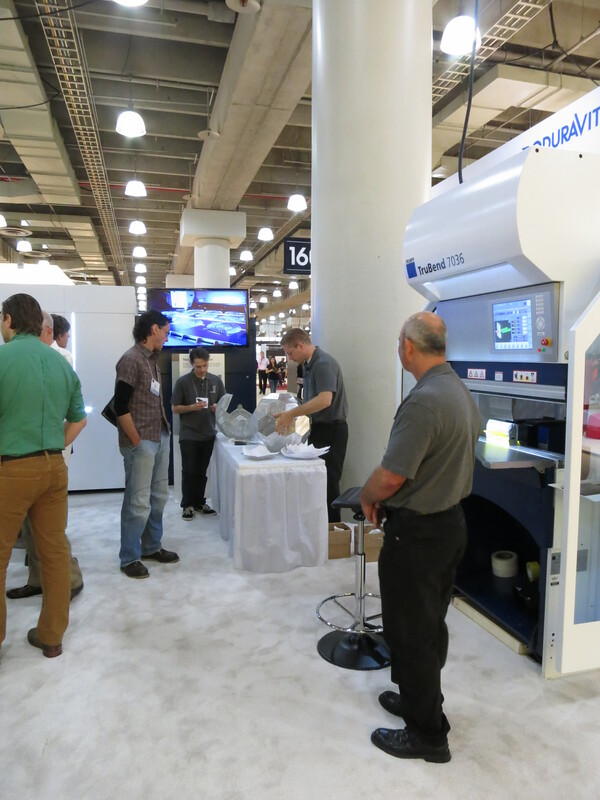 When you are in NY please stop by and see the store and let us know how we are doing. 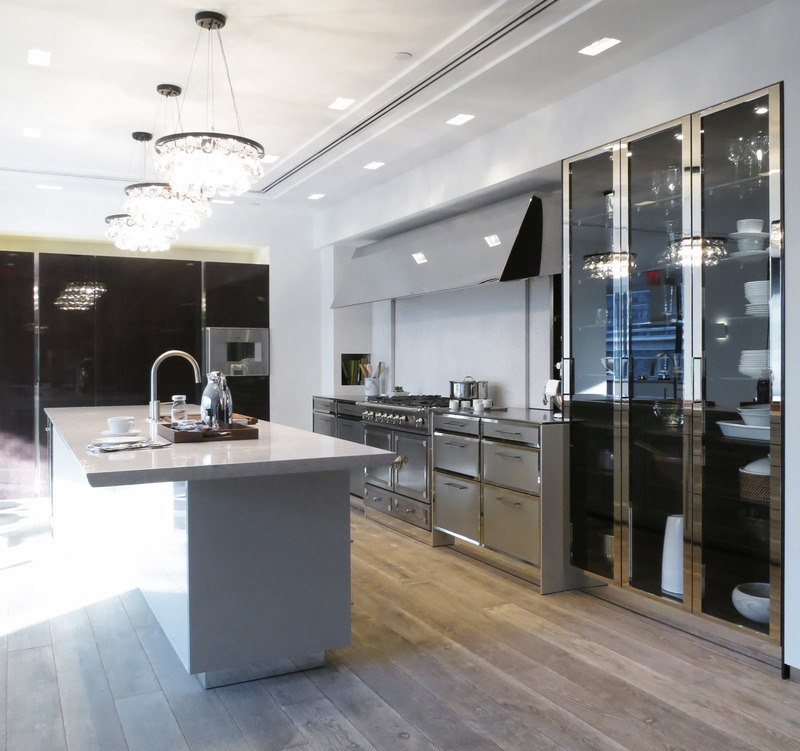 The New York SieMatic showroom has won the KBB Magazine 2014 Showroom of the Year award. 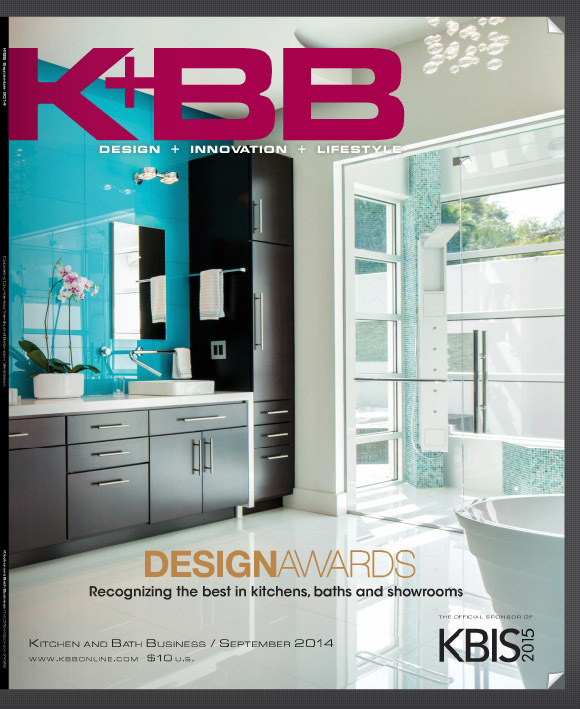 Kitchen and Bath Business magazine, sponsor of America’s Kitchen and Bath Industry Show, is the industry’s leading professional publication. We also won this award for the Charleston showroom back in 2009 and I’m proud to be a part of another award-winning project with SieMatic. 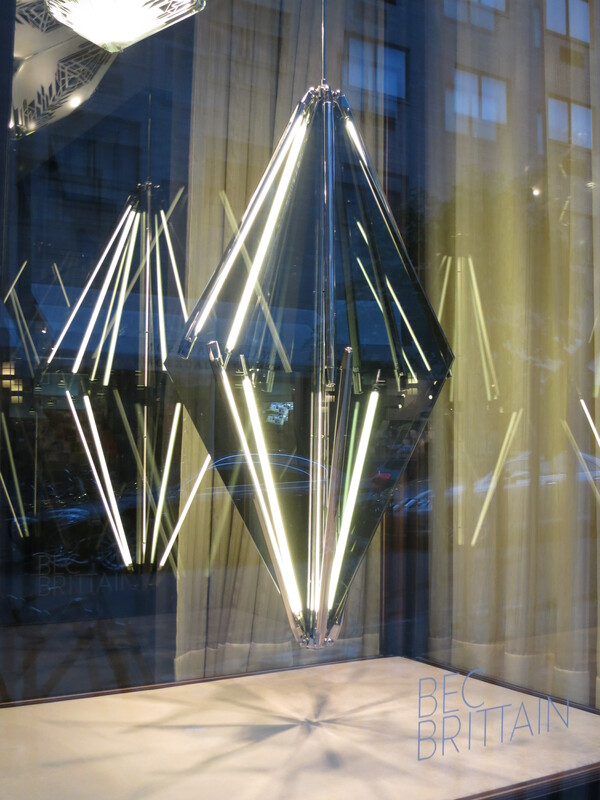 A full analysis of the design can be read in my previous post of the showroom opening. 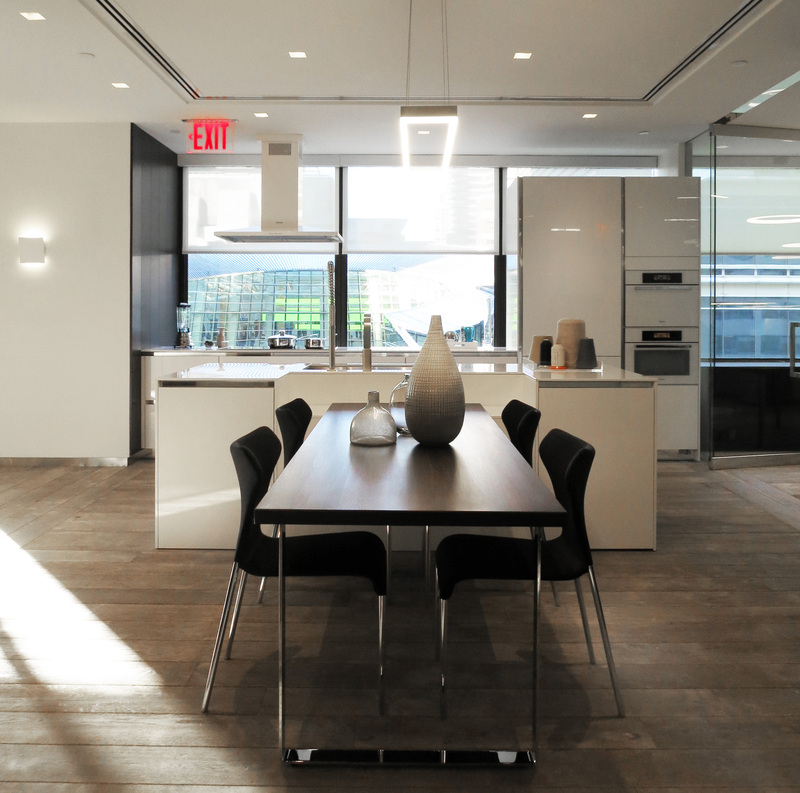 SieMatic is leading the shift to experience-based environments in today’s kitchen showroom design, and wanted to make a big statement with the studio in NY’s A&D building. In comparison with the old layout (a series of small kitchen compartments, each representing a singular look), the new idea is two large apartment environments showing examples of the best in NY living. With new studios under planning and opening soon – Amsterdam, London, Melbourne – SieMatic is moving towards this model around the world. I’m pleased the photographers chose to hone in on some of the styling elements – I worked hard to source and place those objects! I helped write the copy for the award’s application, taking care to explain why we think this design is an important departure from normal kitchen studio design. Happily, the editors clearly have an understanding of what we have tried to do with the design and presentation. Already we have new ideas for the next series of studios, with SieMatic about to unveil some new product and layout design in January at IMM, Germany’s big furniture show in January. 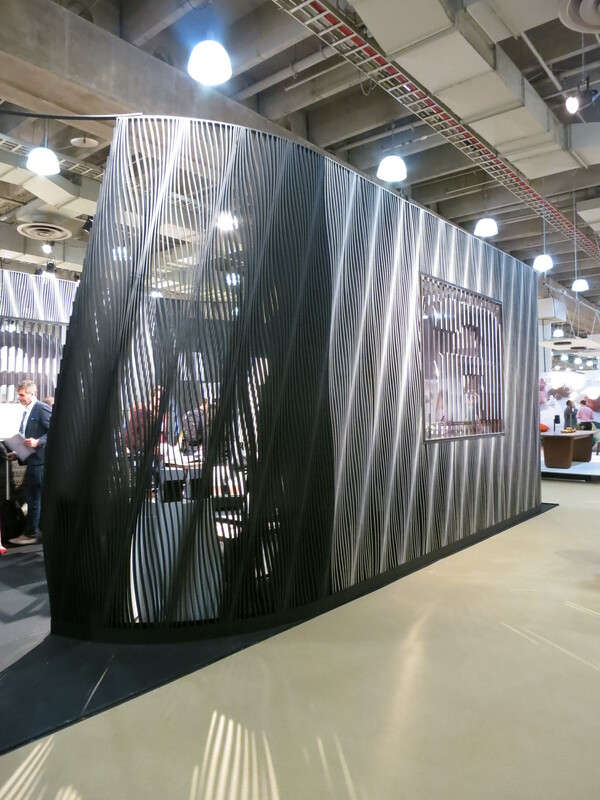 There has rarely been a more exciting time in kitchen design; If you don’t mind a little grey, cold weather please join us in Cologne next year. As always, I am proud to work with such a fabulous team of people and well-respected brand as SieMatic. 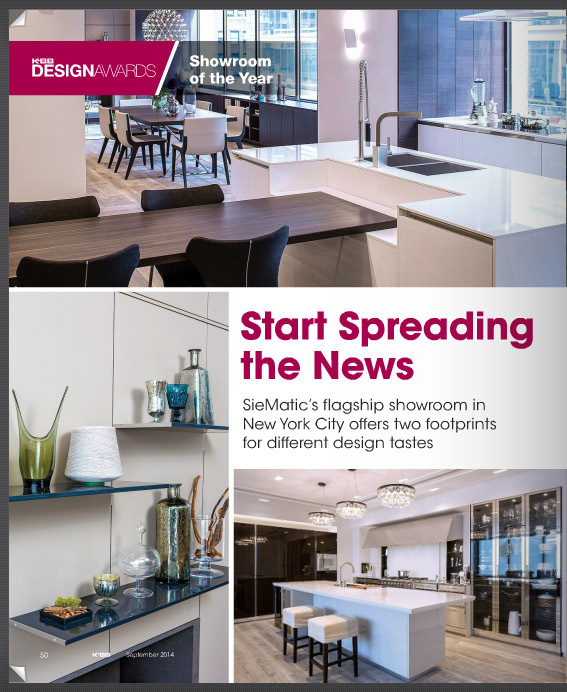 Among our recently completed interior design projects, SieMatic New York is the highly-anticipated and most carefully detailed of Mick’s latest projects. SieMatic’s North American flagship showroom is intended to be the prototype for a new generation of kitchen studios, with carefully and authentically-detailed living environments in place of yesterday’s small kitchen vignettes. With over a year in the planning and making, the project is a collaboration between Mick Ricereto, Chicago’s Mick DeGiulio and Andre Backemaier, manager of SieMatic’s Architecture and Design department. 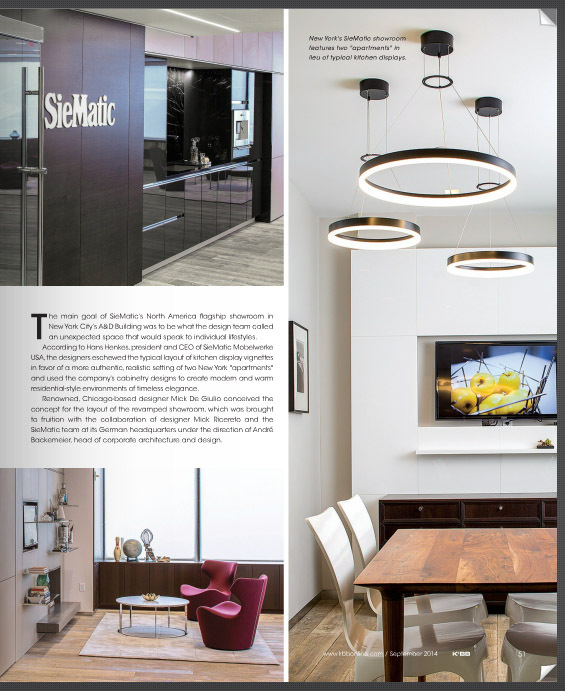 This global team worked together to develop SieMatic’s new studio and planning philosophy called Timeless Elegance. 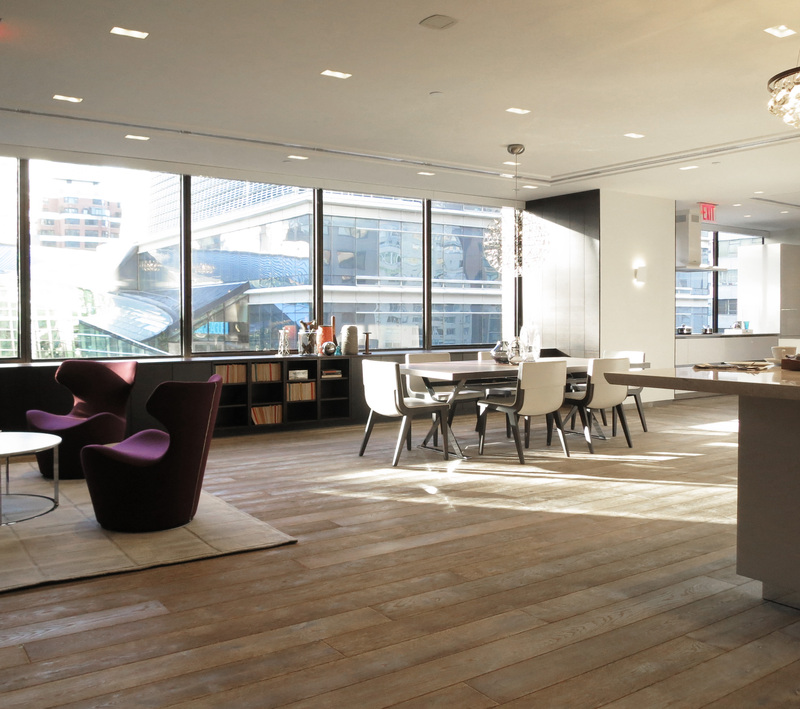 New York is one of SieMatic’s most important international studios, with the A&D building location going back 25 years with the brand. 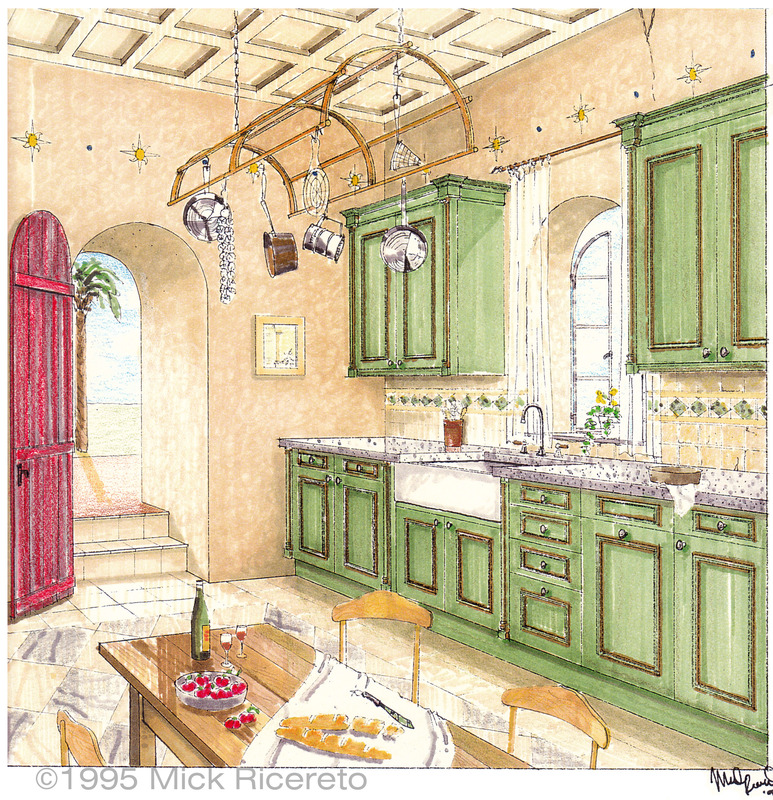 Mick Ricereto has been involved in several renovations over the years, with this newest design a complete departure from previous designs. 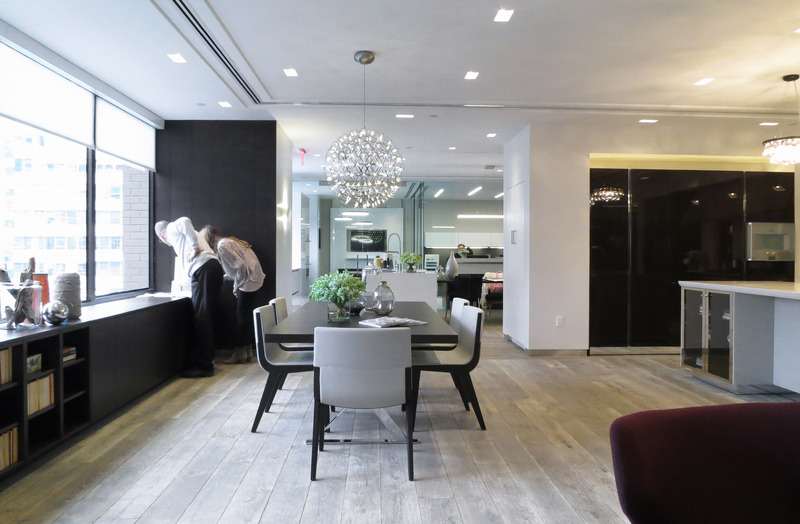 The most important change was to open up the windows to the relatively new Bloomberg Building view, and breaking up the previous small displays into two living environments. The first room is a complete Beaux Arts apartment, with kitchen, bar, seating and dining areas, unified by a subtle coffer ceiling. The image above shows the entertainment bar upon entry. Below, the full view of the apartment as the visitor enters the main space. The floor is a grey rustic French oak from Paris Ceramics. The furniture is from B&B Italia, and all the lighting in the showroom is LED, including the candelabra-base bulbs in the chandeliers. One source of lighting ensures a true and even color-cast throughout the showroom, which is important when so much natural light is available during the day. Mick put great care into the styling and accessorizing, to make for a realistic feel. The idea is to bring a little individual character, just like a client’s home. 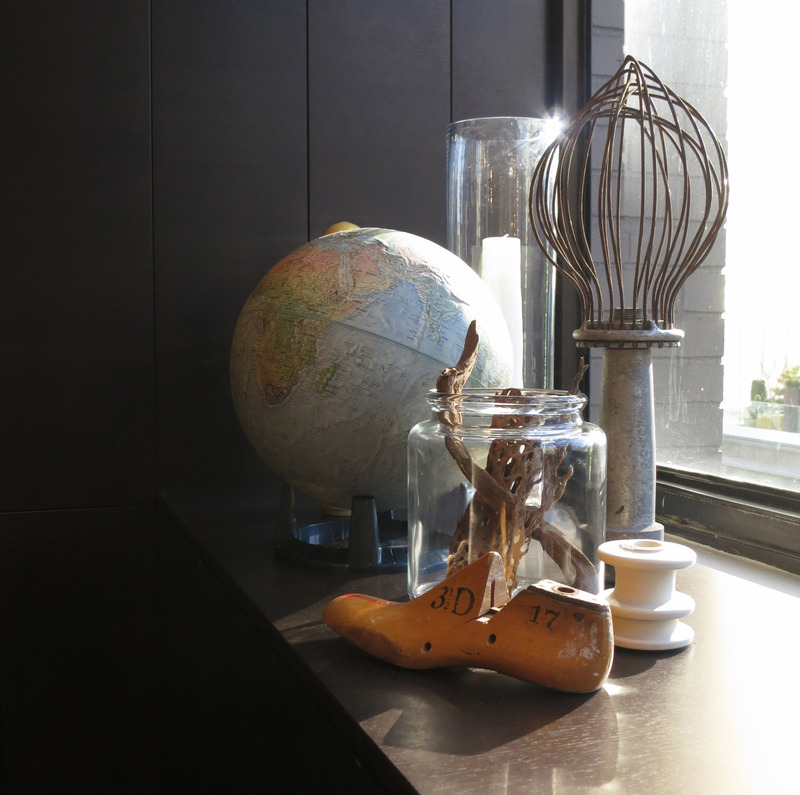 Many individual antiques and salvage pieces were sourced for a personal feel. SieMatic’s Timeless Elegance brings the highest level of luxury to clean, modern design. With glossy wood and lacquer, copious metal finishes and deep stained wood furnishings, this rich palette adds a deep dimension to the rigorous and restrained layouts. 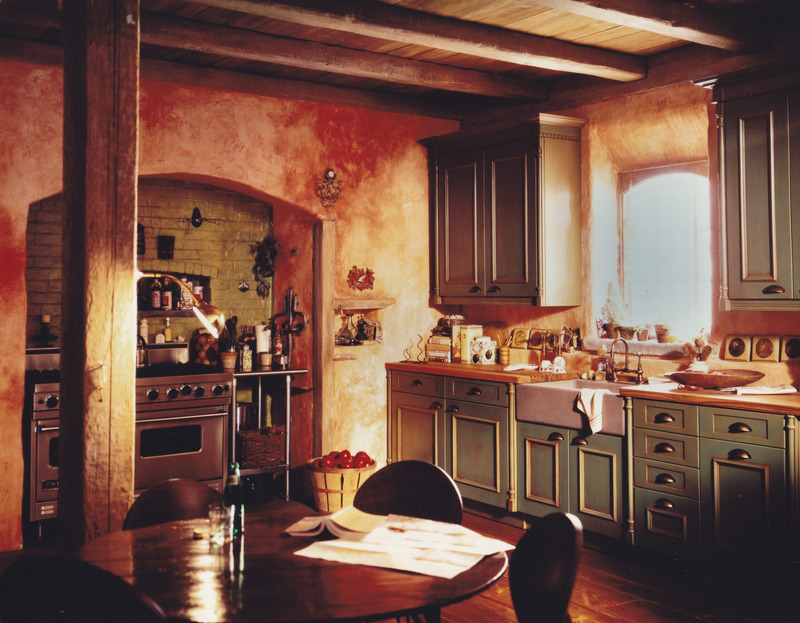 The Beaux Arts kitchen itself is a tour de force of materials and finishes. 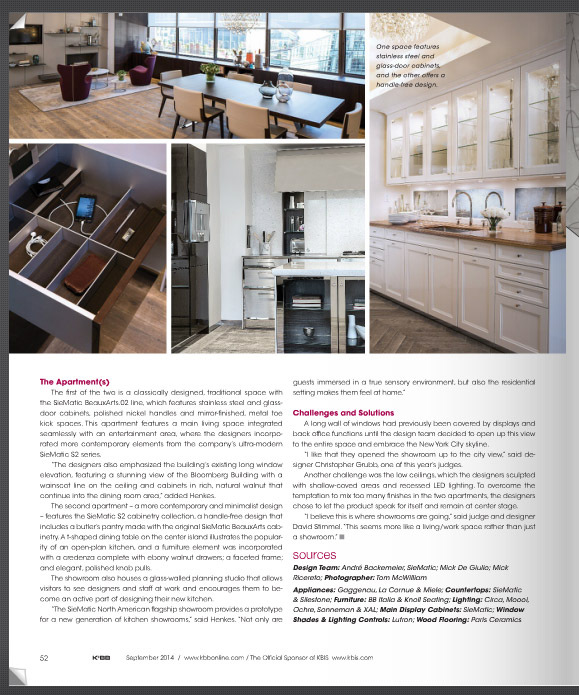 The series is designed by Chicago’s Mick Degiulio, and features his classic ideas such as sliding stone backsplash cabinet panels, polished toekicks and tall polished nickel glass cabinets. In the detail below, the combination brushed/polished pullout drawers bring an extra dimension to a sturdy cooking area. 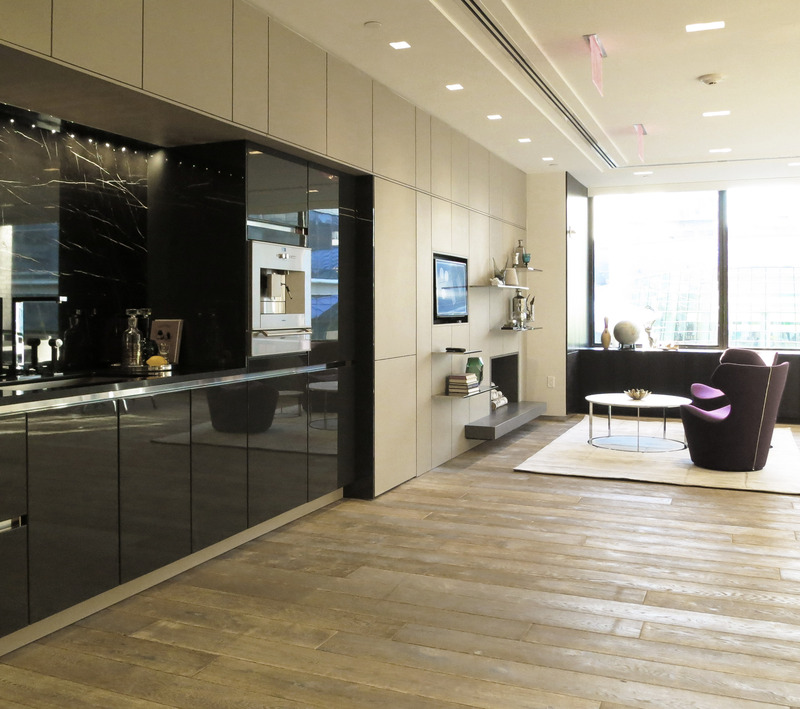 Below shows a styling vignette from the long Ebony Walnut wall facing the Bloomberg Building. Old paperbacks, vintage models, fantastic old wood and vintage spools of yarn bring a touch of eclecticism to the space. Beyond the large Maxalto table by B&B, the Beaux Arts apartment transitions into the second space, a pure expression in Lotus White S2 cabinets. The floor finish and ceiling remain the same though the transition knuckle, drawing the visitors into the space. 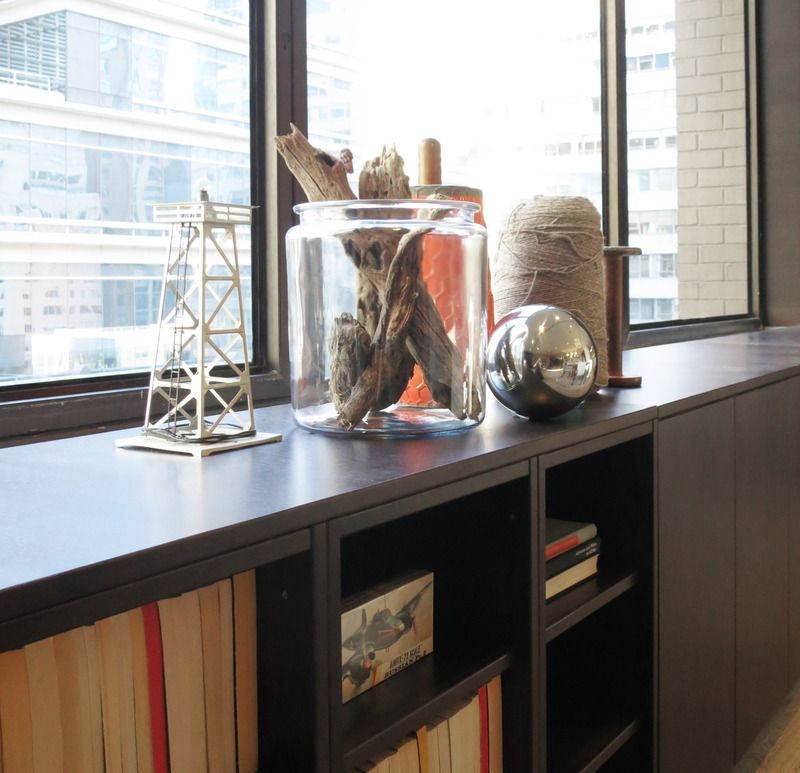 The S2 apartment is joined by the staff workspace, behind glass panels and a finish-matching Ebony Walnut reception counter. Apartment 2 is smaller than the Beaux Arts, but the unifying finishes and visual expansion of the glass walls bring the space together and make it feel like one. The S2 Lotus White kitchen is compact but expresses the architecture of the building by allowing the windows to “breathe” around the cabinets and let the city in as part of the room. Appliances are the new Miele white collection, to further pull the purity of the small space together. The palette is tone-on-tone, with the counter also in white; SieMatic’s 1cm thin quartz called Supreme White. Thin counters show a tailored look to otherwise pure expanses of white. The proportions, details and joints are where the magic is when designing pure, modern compositions. This unity of line and finishes helps bring the space together and allows the architecture and space arrangement to standout and not feel cluttered. Unexpected bursts of color and shape are introduced in the accessories, such as these vintage spools of yarn. An adjacent Honey Walnut shelving area is expressed as open cubes, allowing deep shadows and also the space for a small TV. 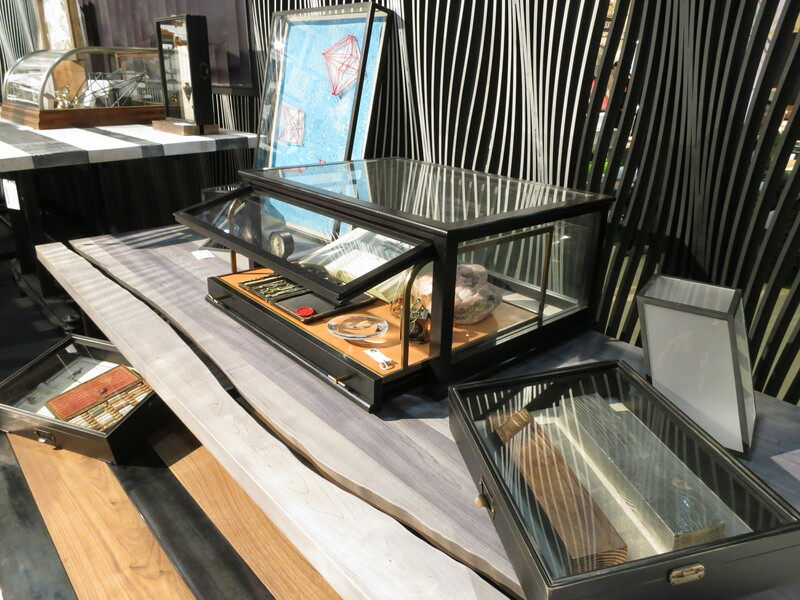 More vintage items are shown, such as old industrial bakery whisks and large electrical insulators. The final space joins Apartment 2; the Butler’s Pantry. Notched into a special little area with another window facing the building hallway, this authentically-scaled treasure box is designed to feel as if it was already there, and we designed the apartment around this architectural gem. 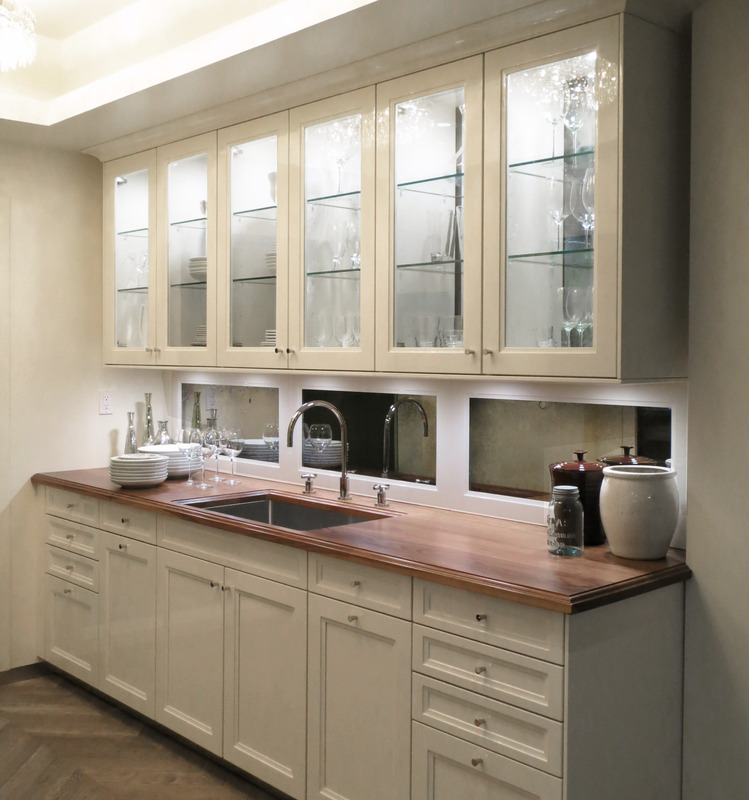 The original Beaux Arts series of cabinets are shown in Magnolia White, augmented by a walnut counter and framed antique mirror back splash and crystal semi-flush ceiling lights. The opening party was hosted by Veranda Magazine and seemingly hundreds of guests poured into the space to help celebrate the opening. SieMatic’s owner Mr. Ulrich Siekmann made the trip across the Atlantic and shared the ribbon cutting with SieMatic USA’s Hans Henkes. 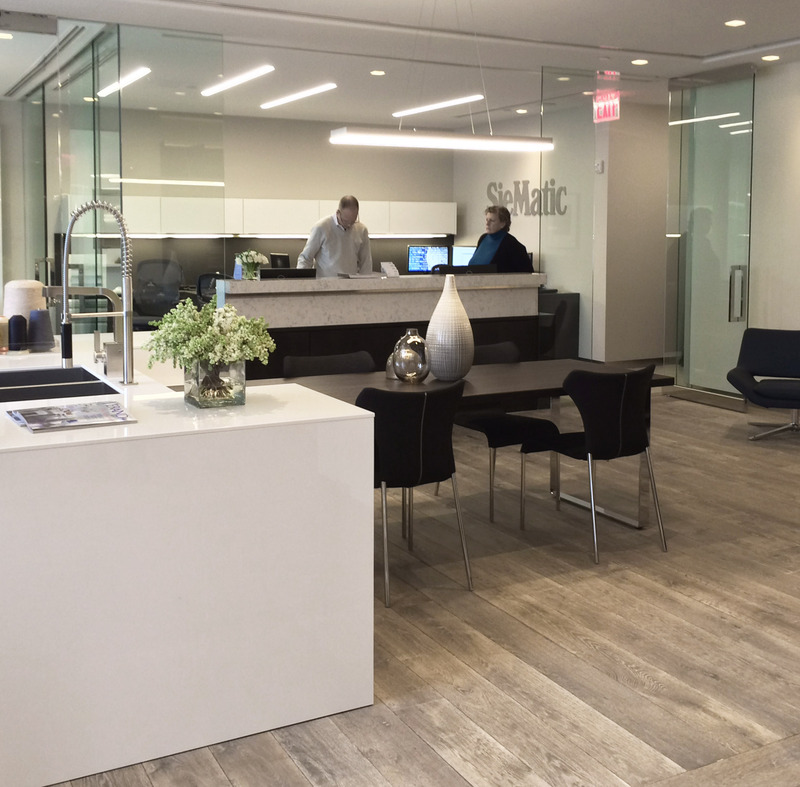 We are very proud to be a part of the project and look forward to bringing SieMatic’s Timeless Elegance to cities all across North America. Other future premier showrooms are planned for London and Amsterdam – look for Mick’s reports on these locations later in the year. 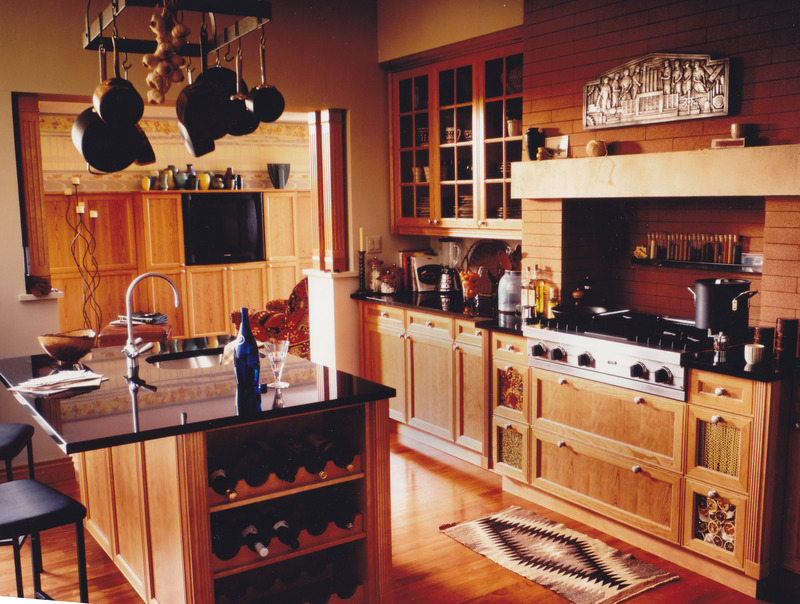 I recently passed through a big milestone, having now been in the kitchen and bath arena for more than 20 years. I went through some old folders and found a large cache of old renderings and interiors projects I forgot I had ever done. I want to share some of my first catalog photo-shoot concepts with you, from my early days as corporate designer for SieMatic North America. 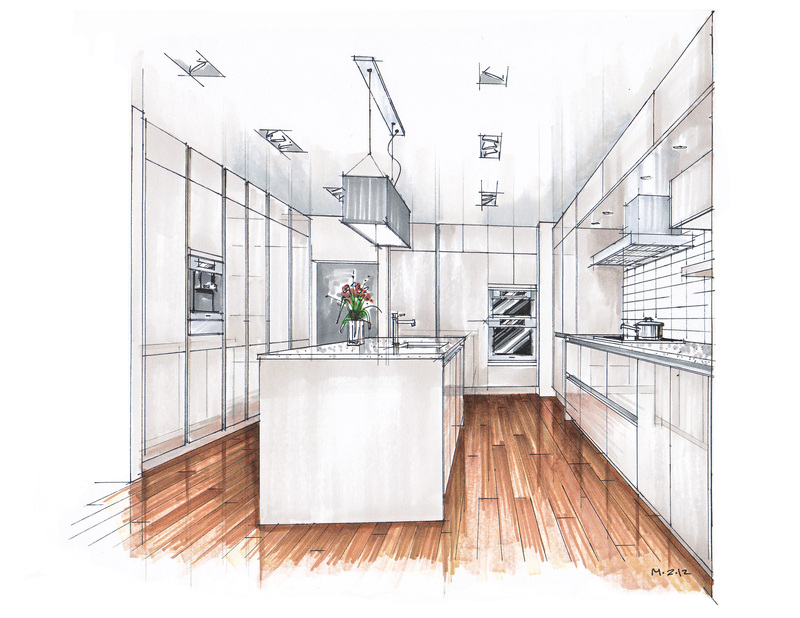 At the time, SieMatic was looking for projects which specifically addressed American style. I did a number of concepts and two were selected for photo shoots. I was still very green in the business and had never worked with pro photographers before. 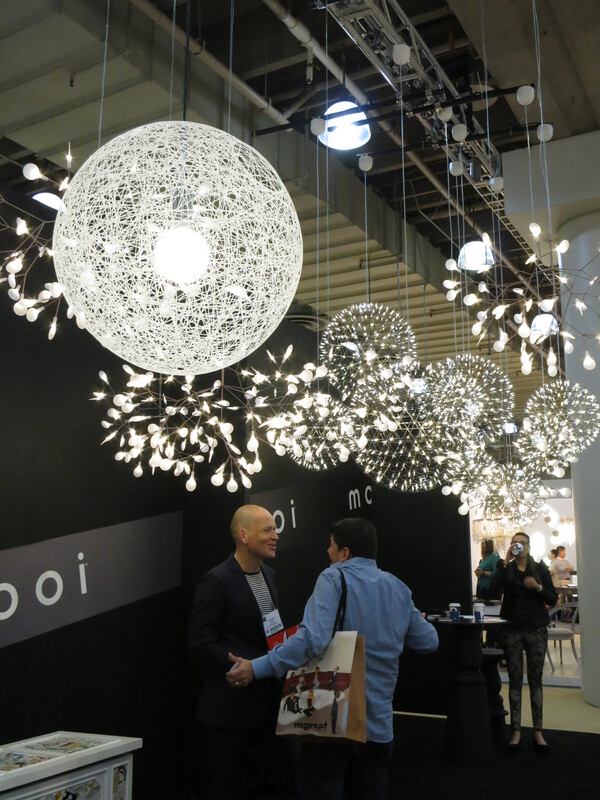 We selected somebody with experience in NYC, and set about ordering all the material. 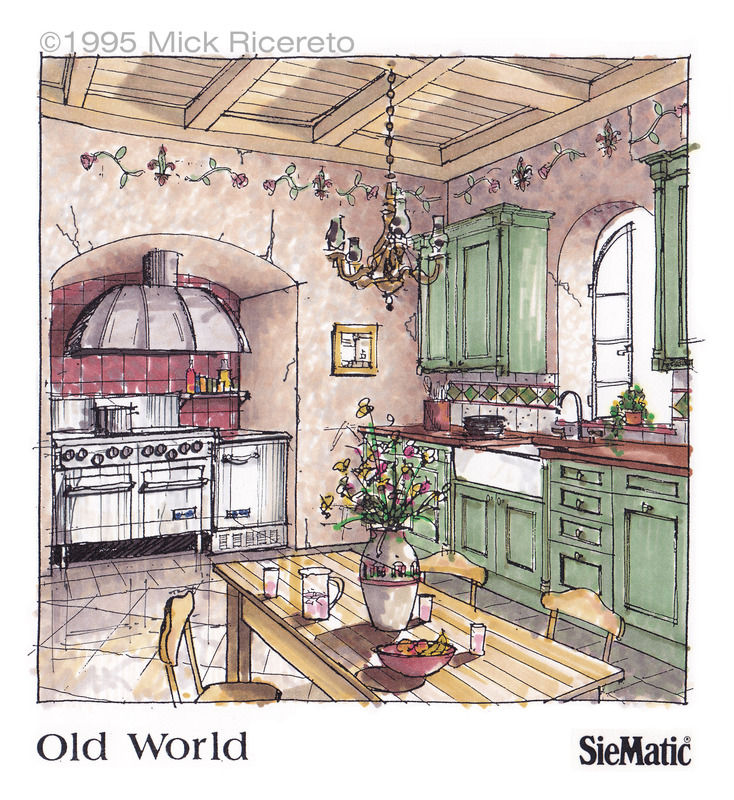 Here are the two original concepts, the first being a Tuscan-type idea I called Old World. I’m not sure what I was thinking with that palm tree… Newport Beach maybe? 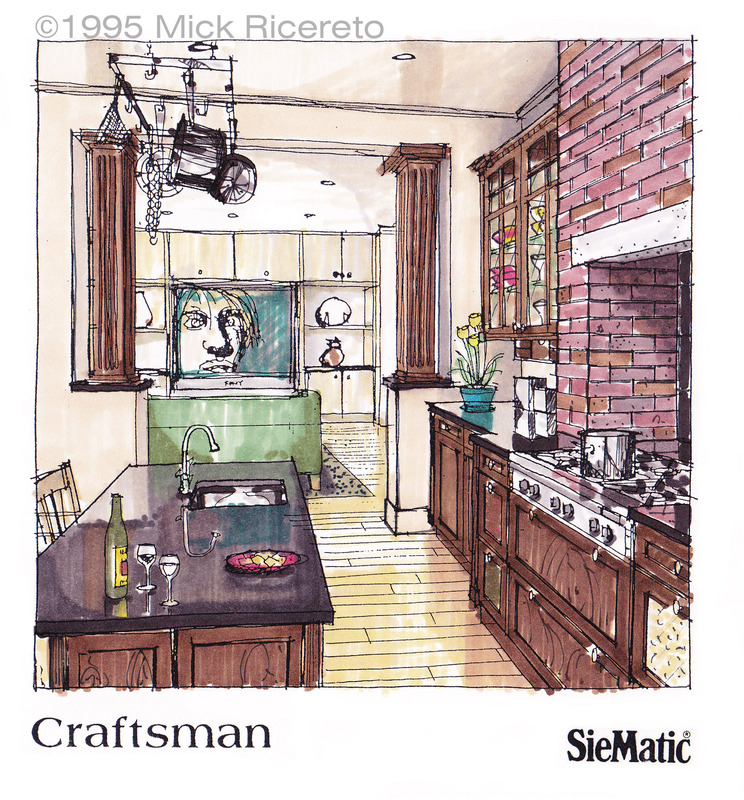 The next concept was Craftsman, which had a decidedly FLLW feel. I have always loved breakfast nooks. Even today I am always trying to explore built-in kitchen seating like this. After looking at the practicality of building the stage sets, I modified the layouts of the displays. The Old World display really needed a cooking area, so I turned that arch into a giant old fireplace-type nook. These next sketches were quicker and were handed directly to the photographer’s team. Craftsman lost the nook and gained an adjoining family room. SieMatic wanted to show the ability to do cabinets outside of the kitchen. Dig that face on the TV! Not sure what type of movie I had in mind for that night’s screening. What is interesting about these renderings is how I still draw like this, many years later. I either do pencil setups and carefully render everything (like the first pair) or I lay down some quick ball point pen and marker it up fast. I still prefer the latter. And now, the final images. These were used for a special brochure, of which I designed the actual piece as well. I had no experience with this type of work and I just winged it. On the set in NY, there was an entire crew to execute these ideas. There was a union set designer, and he did pretty nice renderings. I tried talking to him about his work and the types of opportunities in the business but he shared almost nothing with me. 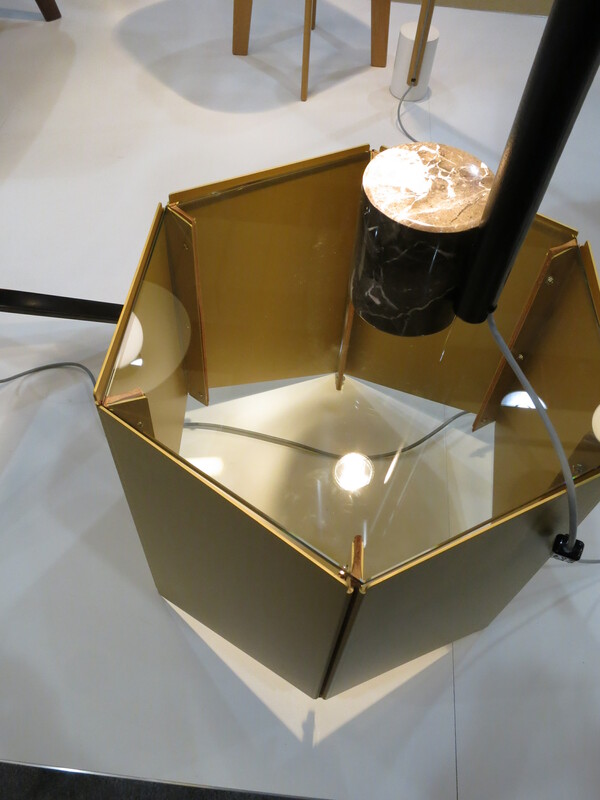 In fact, everybody was completely secretive about the process and their methodologies. I found the whole process bizarre, since I represented the client. I received a print of each image at the end of the project which I think came out too saturated and dark, but this is essentially all I have today. I cannot recall the photographer’s name so unfortunately credit is “unknown”. We did go on to do another set a few years later, called Hudson Valley Collection. I had very little control over that next project and if I recall, the management was not thrilled about the final product. We had an art director and things had scaled up much more the second time around. I learned quite a bit on these projects and went on to head up this work for my projects at Kohler in the early 2000s. I’ll have to post about those projects as well, if I can find the renderings. 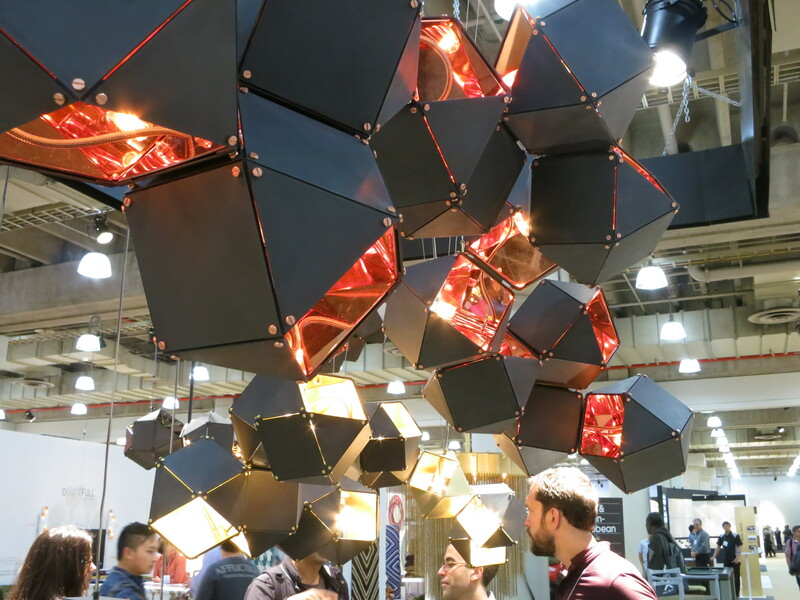 The month of May in New York; that means time for design week and the ICFF Show – the International Contemporary Furniture Fair. I have been many times over the past years but skipped a few recent ones, so it was time to go back. My focus this year was to work with a New York client in midtown, then spend the rest of the weekend looking at lighting and furniture for various projects. 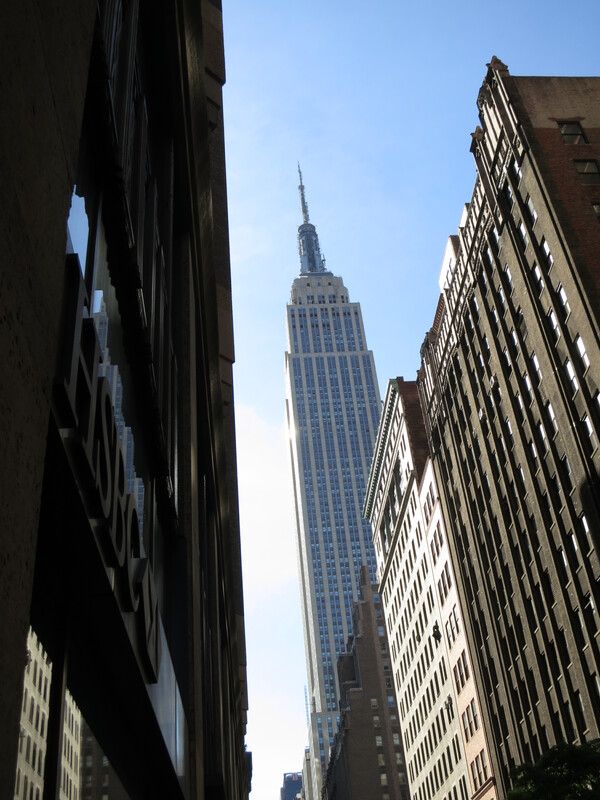 The sun was catching the Empire State Building in such a way to make it sparkle, something I never noticed before. It always seemed so heavy, so concrete. Nice to see something familiar in a different way. Incidentally, I was not the only “tourist” taking this picture at this point. So that made me feel good about stopping, pulling out my little Canon S100 and setting up the shot. 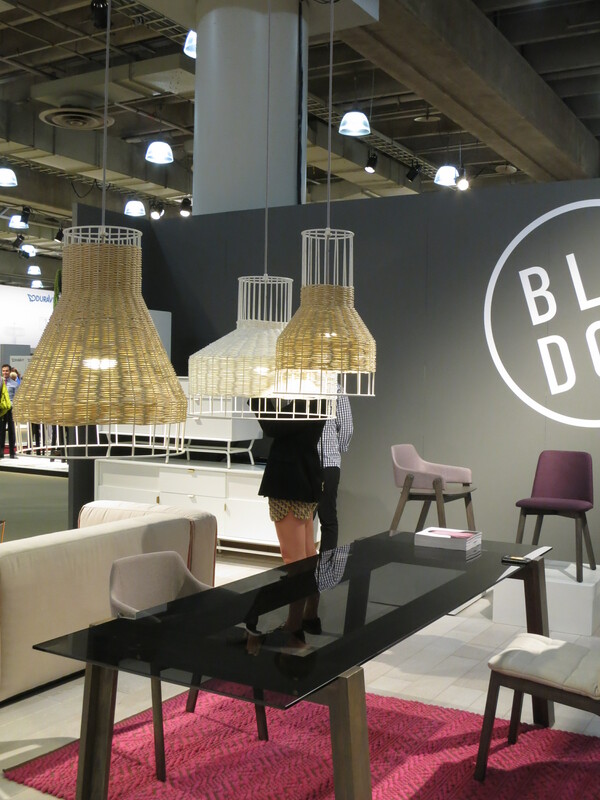 The ICFF show is based at the Javits Center, west of midtown. It is seemingly out of the way but a short walk from the A C and E (blue) subway and Penn Station actually makes it really convenient. I was setup at a nice little hotel with a client of mine and all set to explore the show and all the “outside events”, showroom openings, parties and happenings. 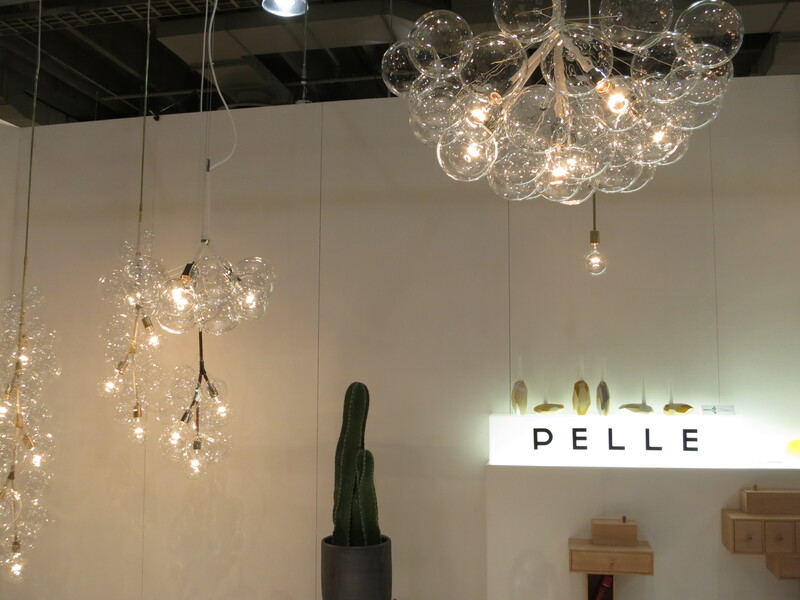 From top left, Rough and Smooth pendants by Tom Dixon, Iacoli & McAllister pendants to the top right, and some very nice clear globe chandeliers by Pelle to the right. Different arrays of glass and paper shades in carefully-draped arrangements were a strong trend throughout the show. Below to the right is Mooii, which always looks good. There were larger brands present, with companies such as Tango showing some very nice new concepts including some outdoor. A company called Graypants had some paper/cardboard/something pendants which were nicely crafted. There were also some concepts with shades made from rapid prototyping, such as lacy SLS shades in “natural” white. Open-ness and interesting screen materials were dominant. 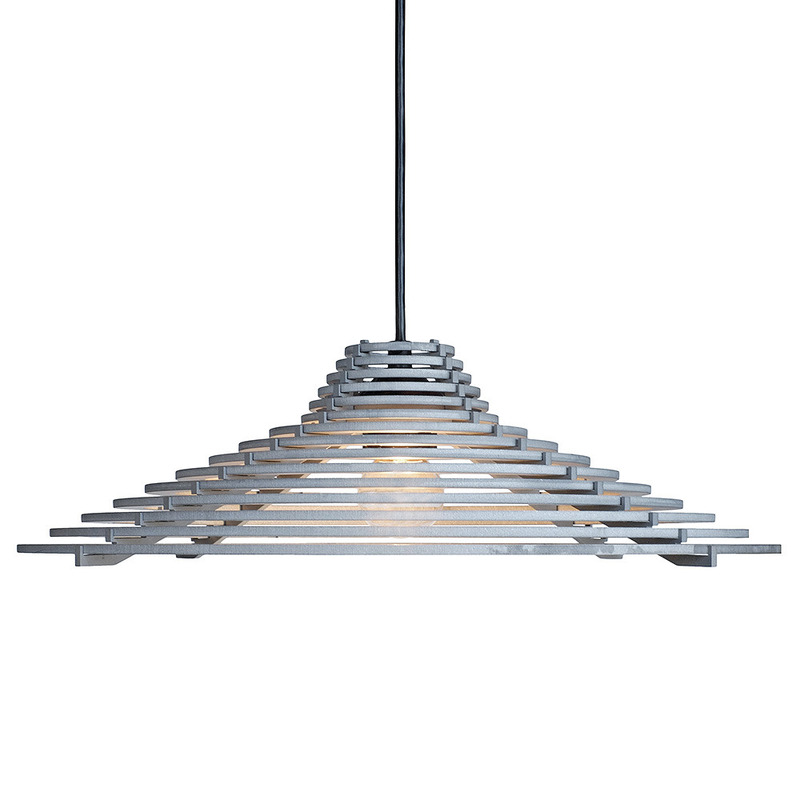 I really like this fixture. 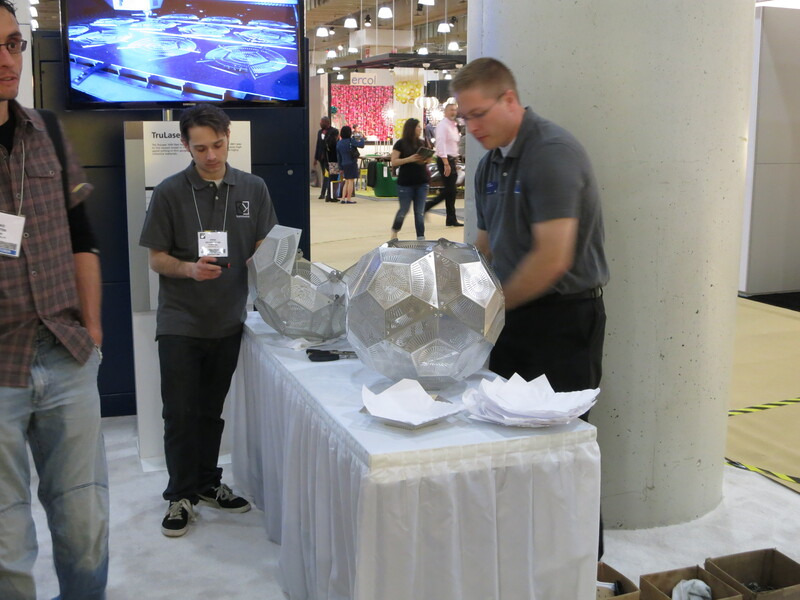 Dodecahedron? I didn’t count sides. Anyway, it is make by laser-cutting aluminum sheet, including all the holes. I don’t know how much waste you get from making the holes, as the material is burning off during the cutting process. Anyway, other than some muted humming coming from the giant stand-alone laser cutting machine, the only noise on the makeshift factory floor was the sound of simulated mirror-folding/film advance of peoples iPhones as they took pictures of the manufacturing process. And a closeup of the assembly table shows the men riveting the Death Star together. 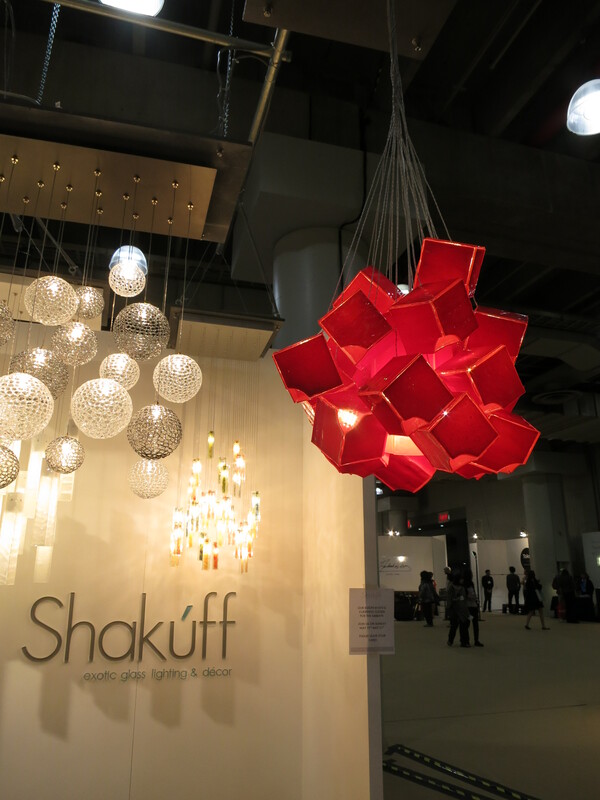 There was a small stand set up with some fine hanging fixtures called Shakuff. The owner was not around but I looked closely at the artisan glass shades – very nice work. I’m not sure how the red box shades were made. 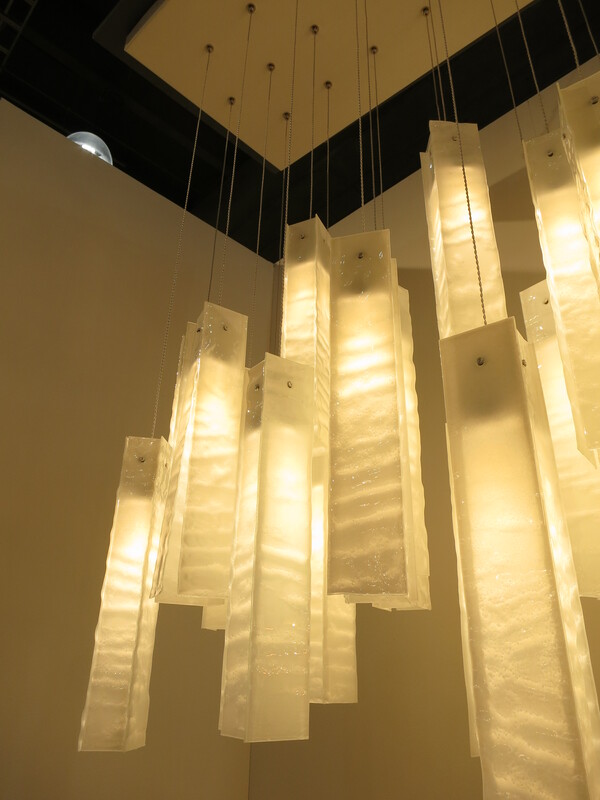 This next piece was comprised of hanging sheets of wavy glass, in a box shape (in plan) which made them seem like towers of wavy glass. A very cool effect. Next up I passed Roll and Hill. 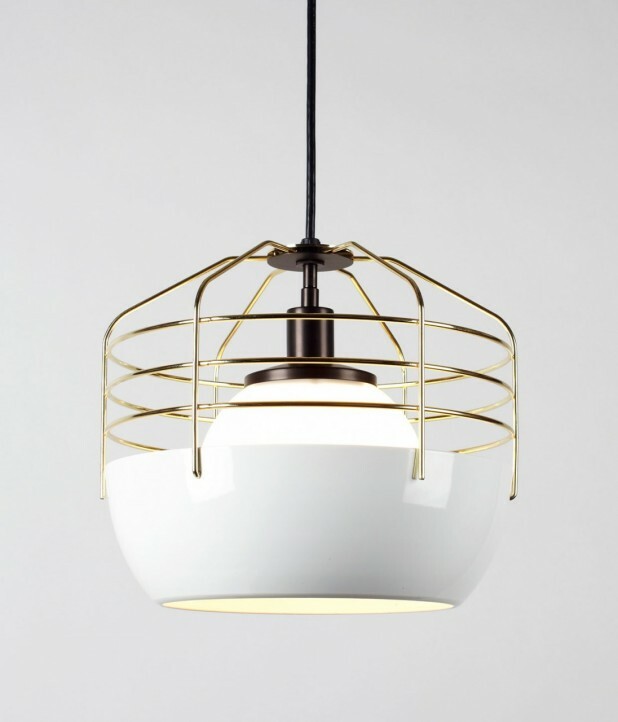 I love what this company is putting out, and this particular hanging pendant kept catching my eye all weekend (I saw it around town and on various show reports over the weekend) – it is called Bluff City by designer Jonah Takagi. Splendid. 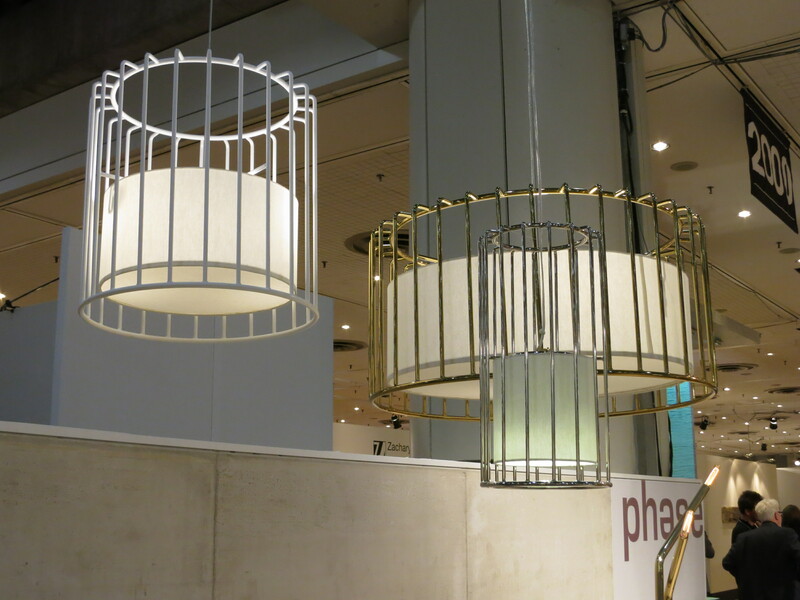 A continuing trend is to use wire to make open-looking shades. 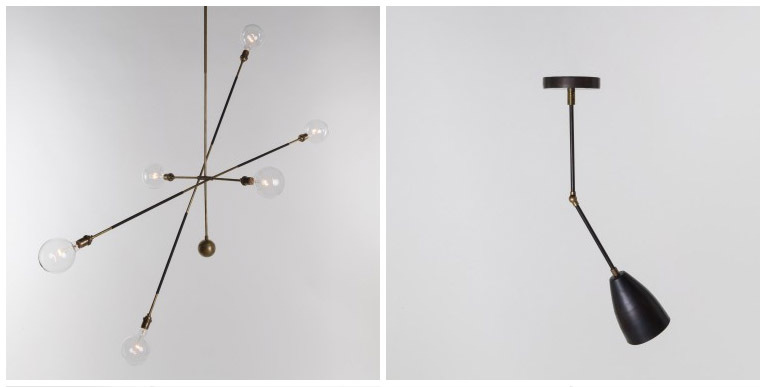 Some fixtures in this vein by makers Phese and Blu Dot, respectably. 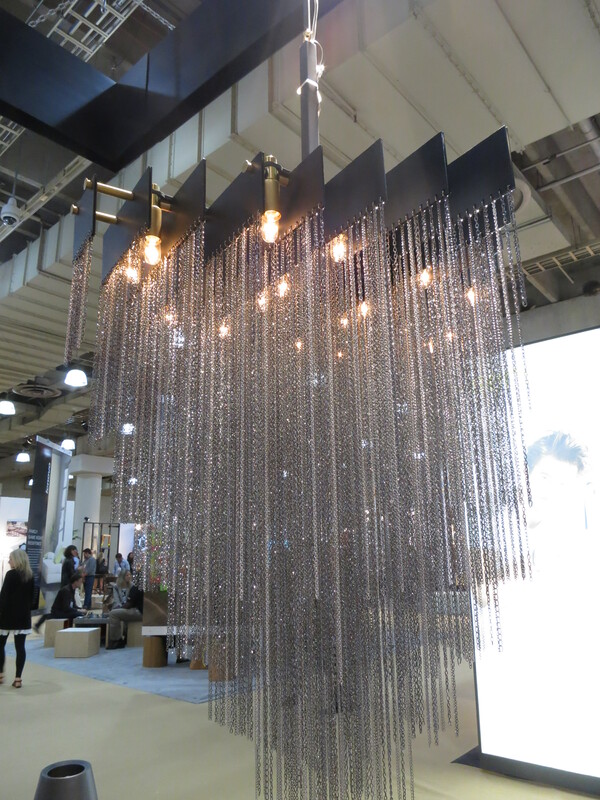 Also shown was this hanging chain chandelier called Kelly. 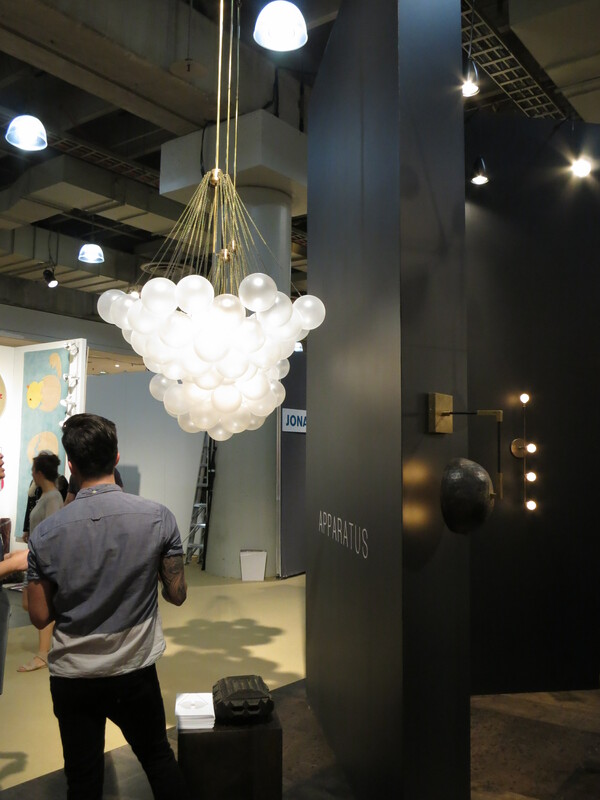 Something unrelated to lighting; this is Amuneal’s exhibit, which won the Best of Show award. It was truly stunning. 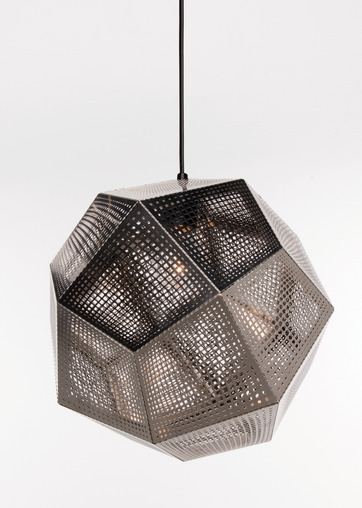 The exterior was made with rather thick gauge metal and formed an undulated surface. 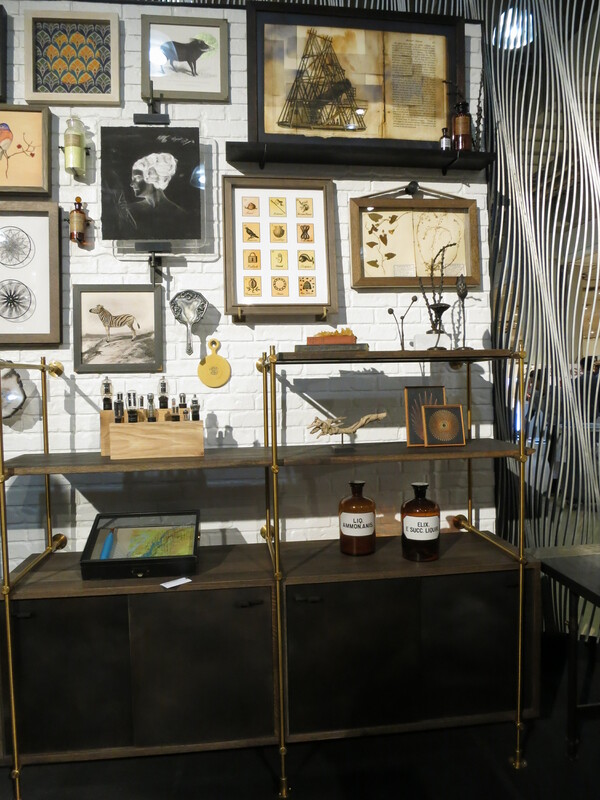 The interior had a “cabinet of curiosity” theme, with vitrines and display cases all (seemingly) designed for this show. 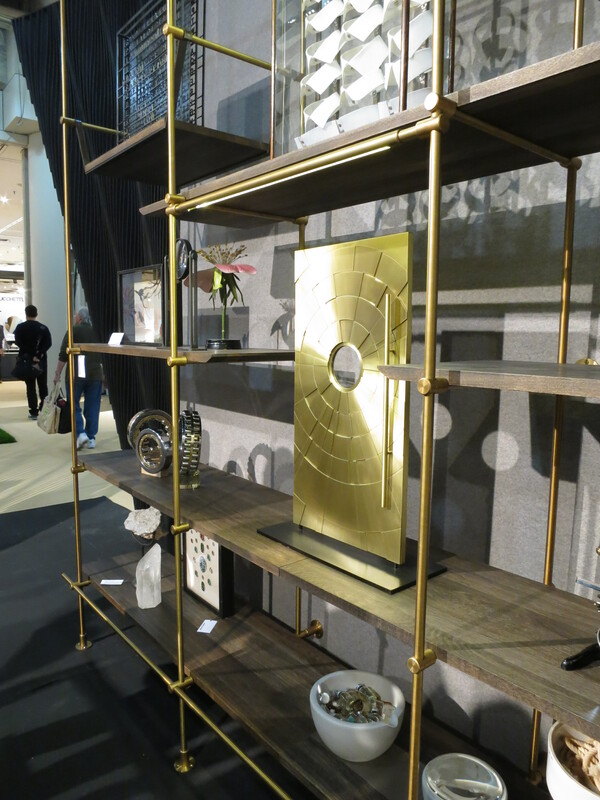 There was a very high level of craftsmanship and composition on view at Amuneal. The shelves and vitrines were tagged with prices for each configuration. I found them to be quite reasonable for what is custom-made artisan furniture made of real brass and wood in their Philadelphia shop. 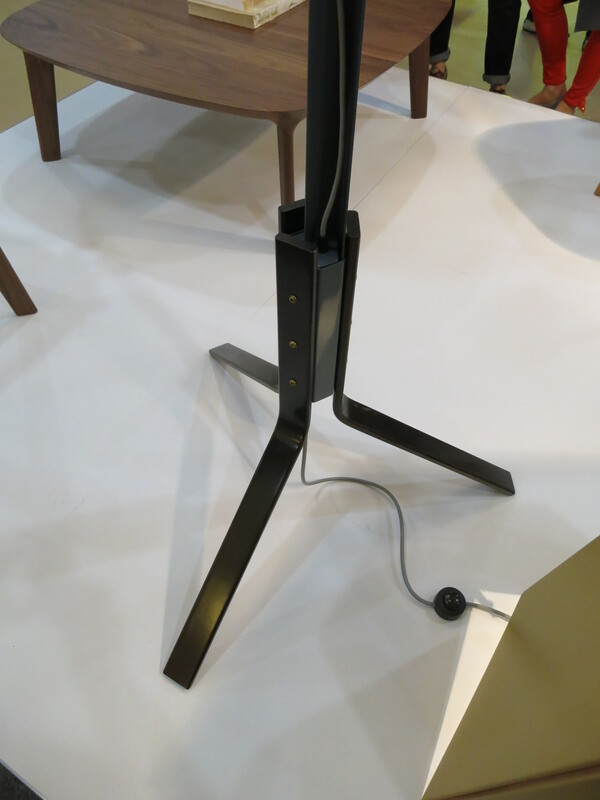 There was one other display which knocked me over with delight, and that was the similarly-styled (black and brass) exhibit of Apparatus Studio. 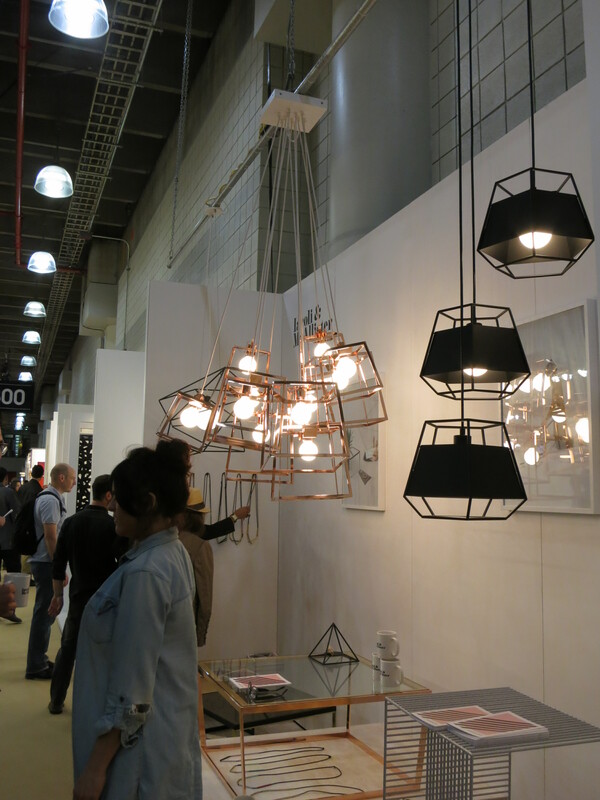 On offer was a wonderful collection of lighting which just floored me with its beauty and obvious quality. My pictures do not do this product justice. 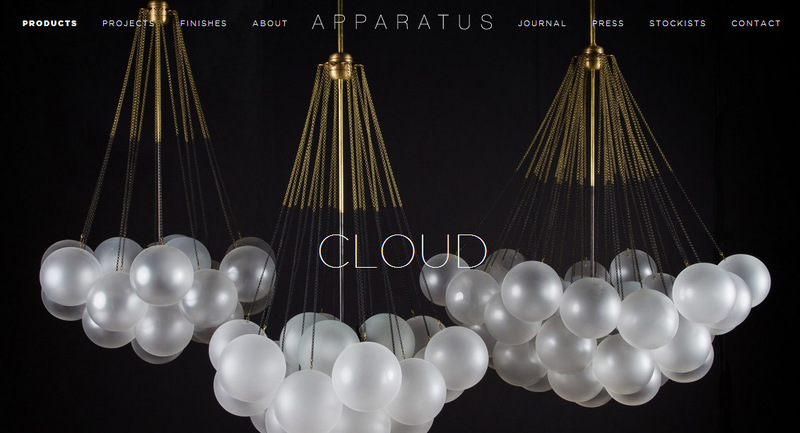 Here is a detail of the Cloud chandelier. Some more products from their website. 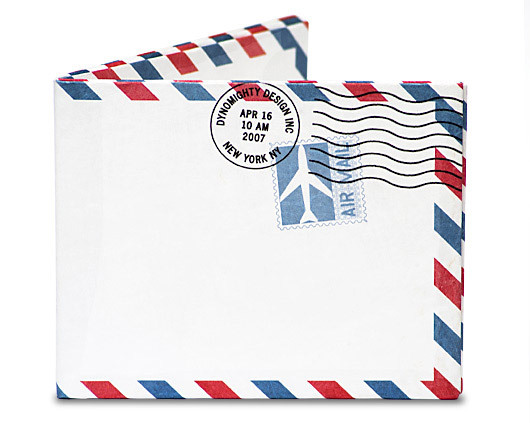 I should also mention that I bought another Tyvek Mighty Wallet by the maker of Dynomighty himself, who always sets up a table in the Design Boom section of the show. When I go to pay for things, every shop owner always compliments me on my wallet so I had to get another, again. Later that night I wandered around Soho and checked out the parties and openings. 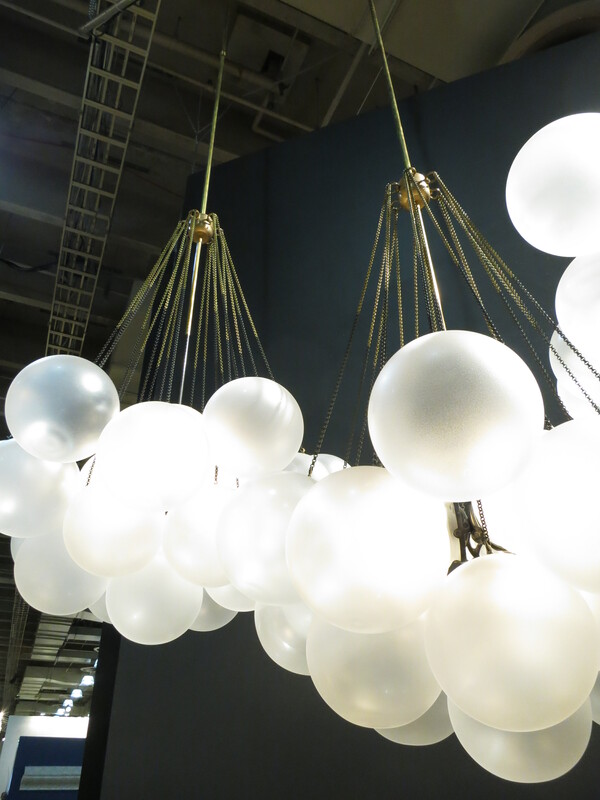 I looked at the new kitchen showrooms and looked around for some lighting as well. I missed the opening reception but I made it a point to try and check out the E.R. 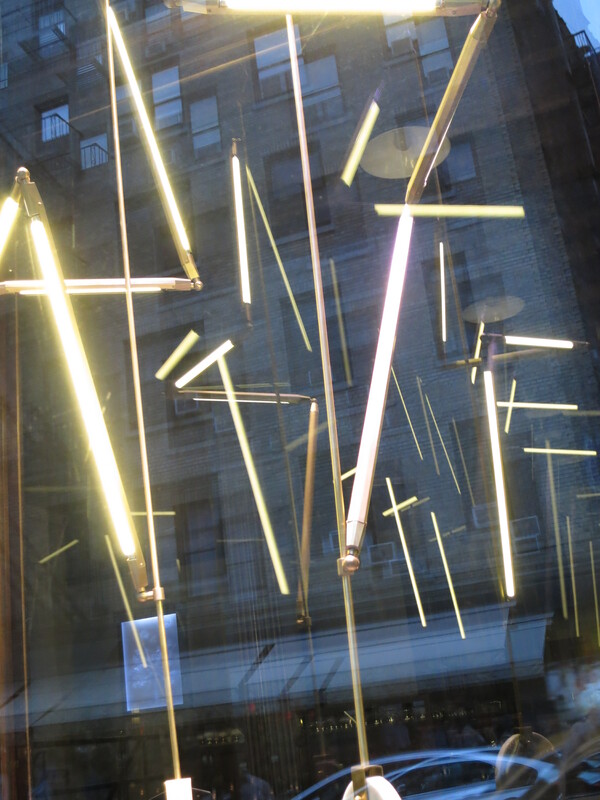 Butler shop in Nolita, which was featuring some amazing lighting by designer Bec Brittain. Here are some pics of the window displays. 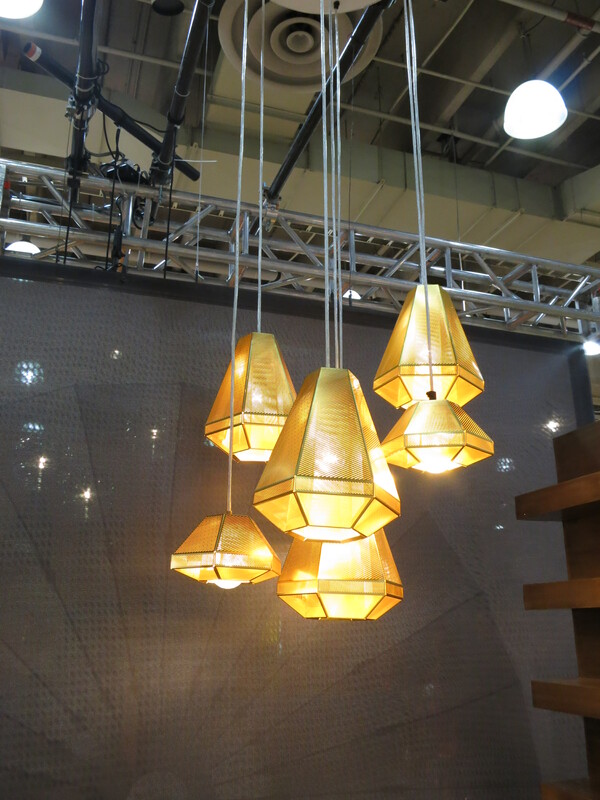 Made of brass, wood, LED strip lamps, marble… these were exquisite. I didn’t know E.R. Butler commissioned this type of work. If not familiar with this company, seek them out online, they produce an incredible collection of architectural hardware, such as reproduction and original door knobs and other assorted pulls and knobs. I really wanted to see this small storefront as this shop is invitation only. Well, maybe next year. 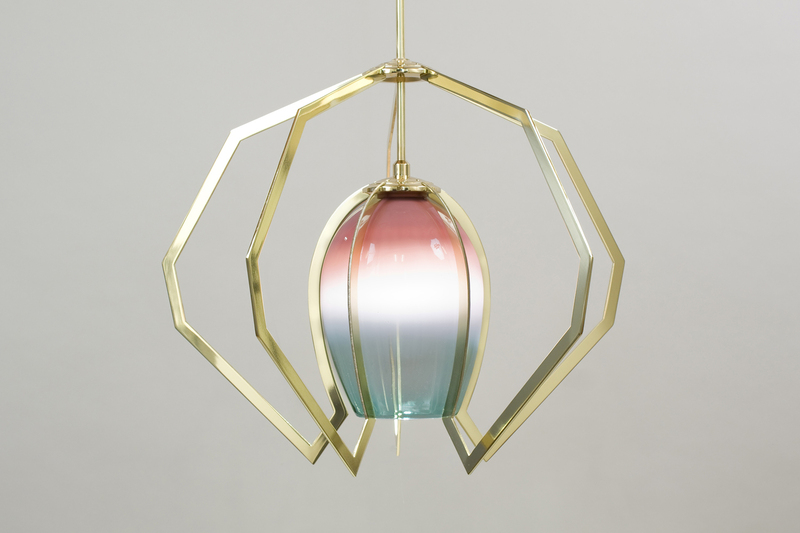 From Bec Brittain’s website, one more incredible design. 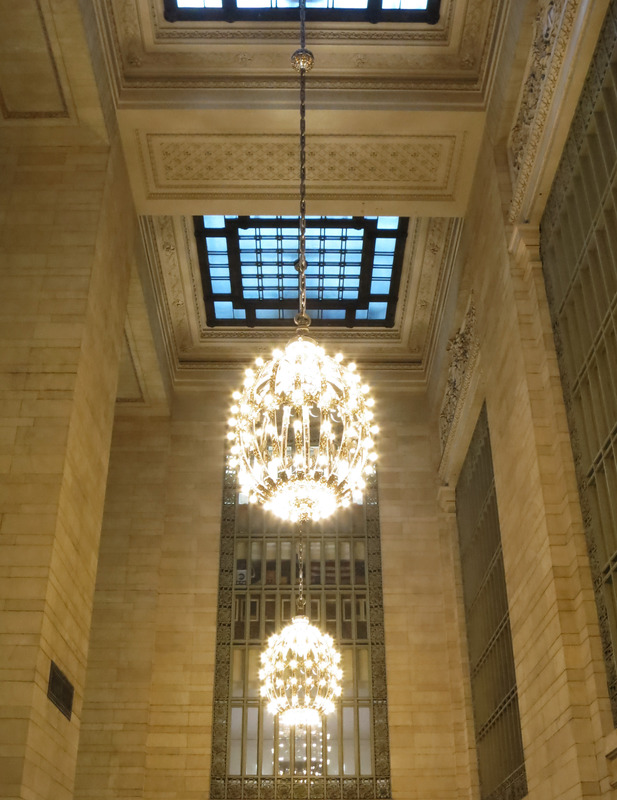 The last thing I did before leaving the city was take a walk through the amazing Grand Central Terminal, which is 100 years old this year. I thought there would be special exhibits and maybe a gallery of construction photos or some other display… but alas there was nothing. Well the building itself is of course wonderful, so I close with this interior shot. I wish this great building well as it enters its second century. I’ll be up in NYC more this summer as my interiors project begins construction. More on that later, as we enter the demolition phase soon. Before doing an entire store layout, we decided to render just a concept of the front of the space, to show how warm and inviting we could make the furniture layout from the outside. When a given space has windows on 2 or 3 sides, it does wonders for publicity but can be a challenge for a kitchen showroom. Our concept shows how we integrate a “Total Home Design” feel to the entrance; visitors can see a kitchen and a sitting/living space complete with TV, seating, fireplace. 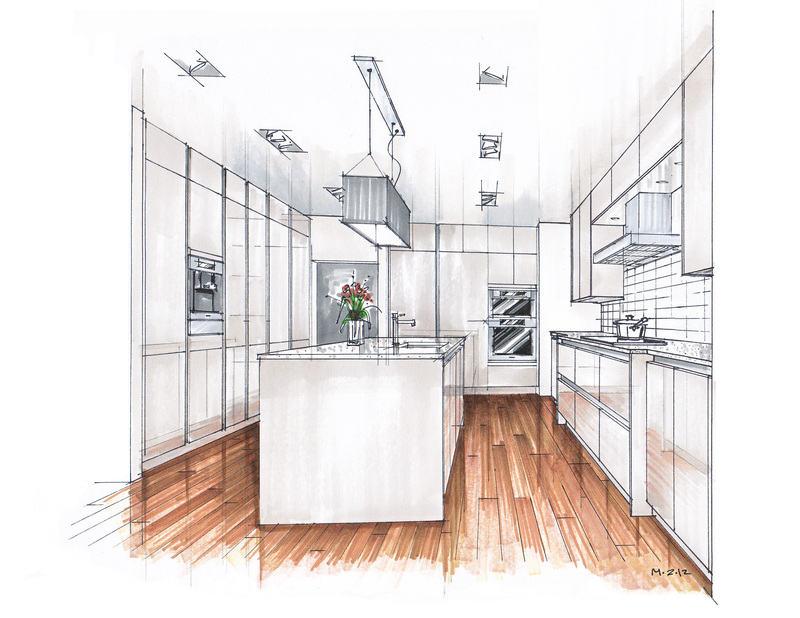 The kitchen and living space are designed in harmony as one, the way home renovations should be considered. I have been lecturing about this type of renovation and will post on my concept of Total Home Design in the future. A detail view of the kitchen; notice how the “soft side” of the kitchen is arranged towards the living area (with wood shelves and a wood seating area), and the “hard side” which is water and stain-resistant, faces away from the seating and allows kitchen play and it’s inherent messiness to stay isolated from the soft side. 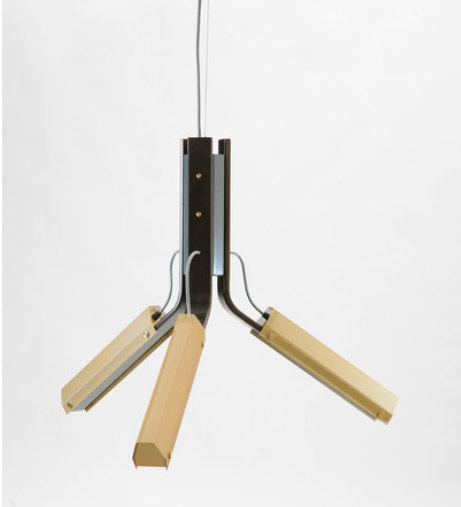 Finishes are Agate Grey gloss lacquer and Honey Walnut veneer. The upper cabinets bridge over the way into the rest of the studio. This bridge connects to the fireplace/entertainment unit and helps tie the design together. Next up is a concept here in the US. We have a large showroom which we are considering renovation, but again, want to make the front entrance as inviting as possible. The same classic modern Agate Grey finish was selected, this time mixed with Graphite lacquer. This display is more of an “entertainment center” or “wet bar”, with sink, coffee station and refrigerators behind panels. Again we see a bridge to the seating area. Across from this setup is the main kitchen, which is a more formally-presented Beaux Arts 2 display. The idea is to keep the entire space in harmony. It has been a busy close-out of the year, with exciting projects all over the globe and some extremely satisfying industrial design projects as well. I have been considering new 3D software in the new year, if I can make up my mind on what to go with and then commit the necessary time for training. Looking forward to 2013 being as diverse and exciting as 2012 has been! 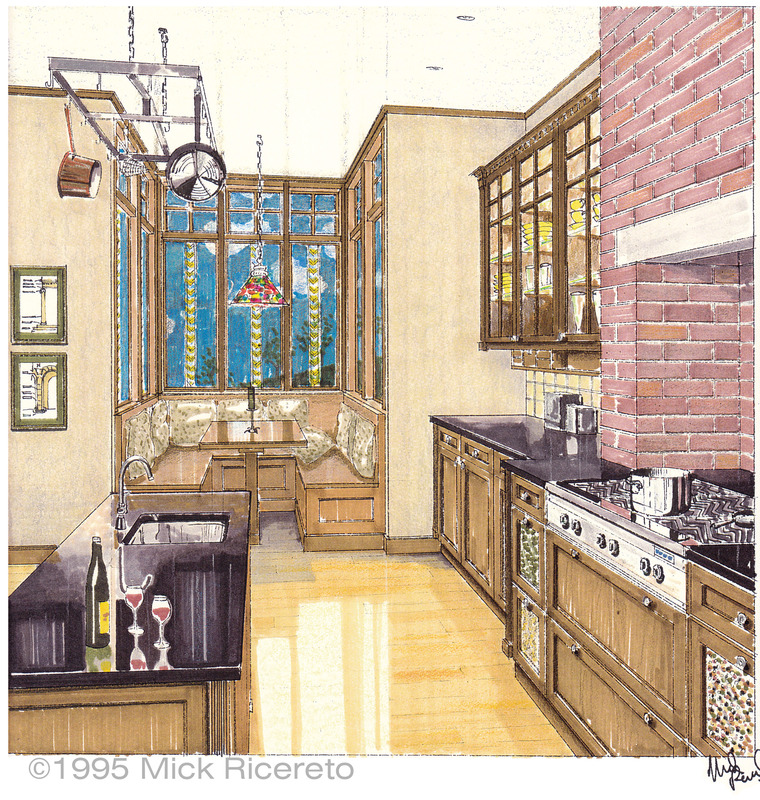 I have recently been retained to design some kitchen variations for a condominium project in NYC. The architect’s plans were a little generic, so we prepared some concepts for the developer in hope of winning the project. Following is a study of two variations. The focus was on elevation C; the rest of the layout was the same between each variation. 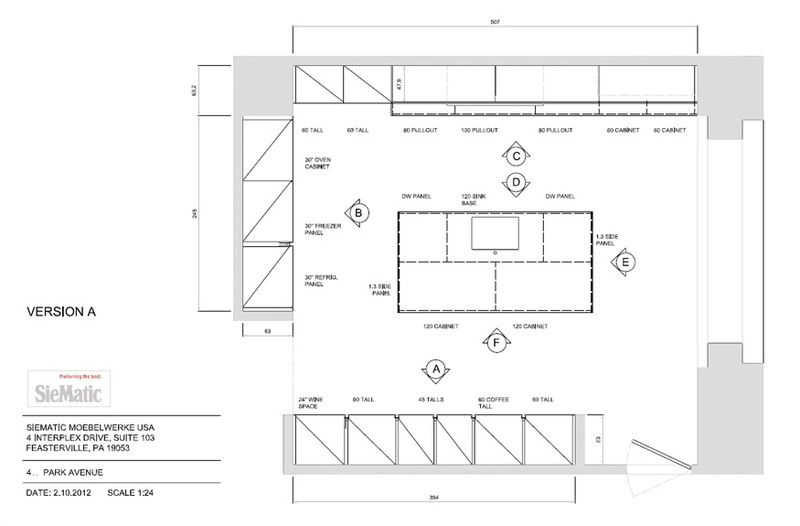 The design consists of a basic island-within-rectangle layout with two entrances. 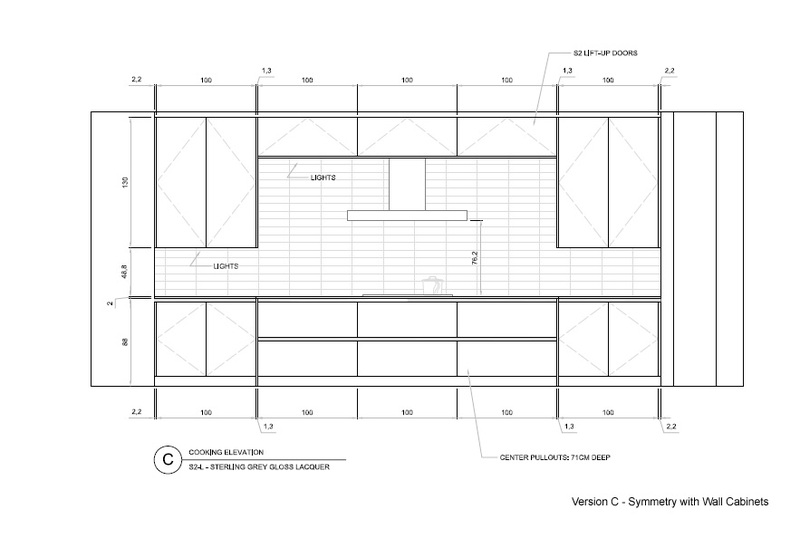 Elevation A and B consist of tall cabinets, with the work surfaces focused on the island and elevation C.
The developer’s architect placed the cooktop in the center of wall C. I executed a few concepts which visually broke this predictable symmetry. 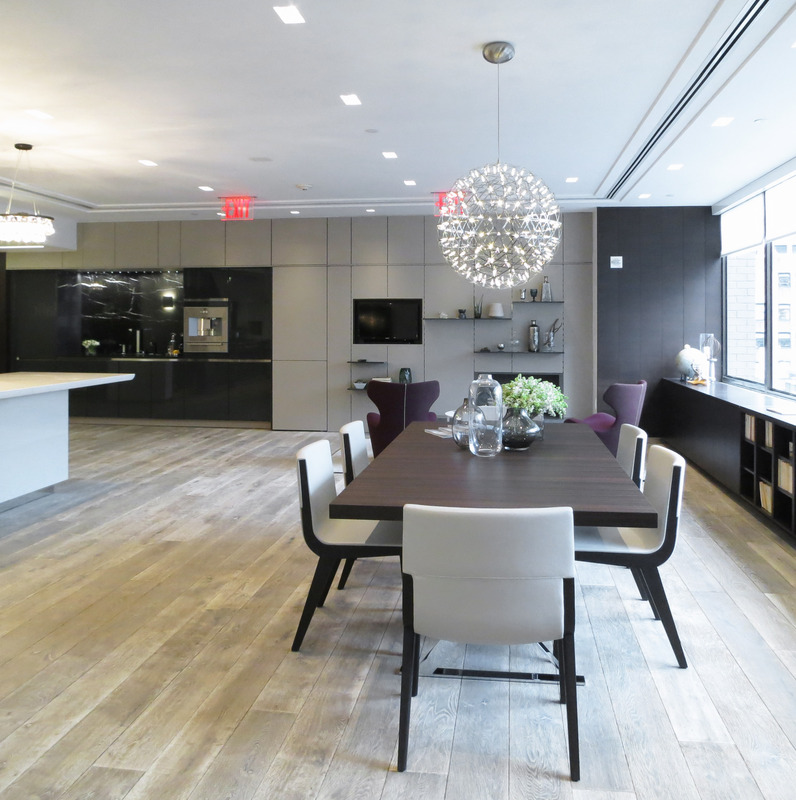 Version A is an example of how we used differing depths with wall and tall cabinets to create visual interest. I executed some marker renderings at a tight angle to show the entire kitchen and also to illustrate the changing depths to good effect. I placed the tall cabinets on the left, so as to open the kitchen up towards the windows. This also allows a flow with food storage moving towards the right towards preparation and eventual serving. Version C was the best of the symmetric variations. For the renderings, I created a base drawing and then created the variations for elevation C, adding them later as layers in Photoshop. The cabinet finish is Sterling Grey Gloss lacquer in each instance. 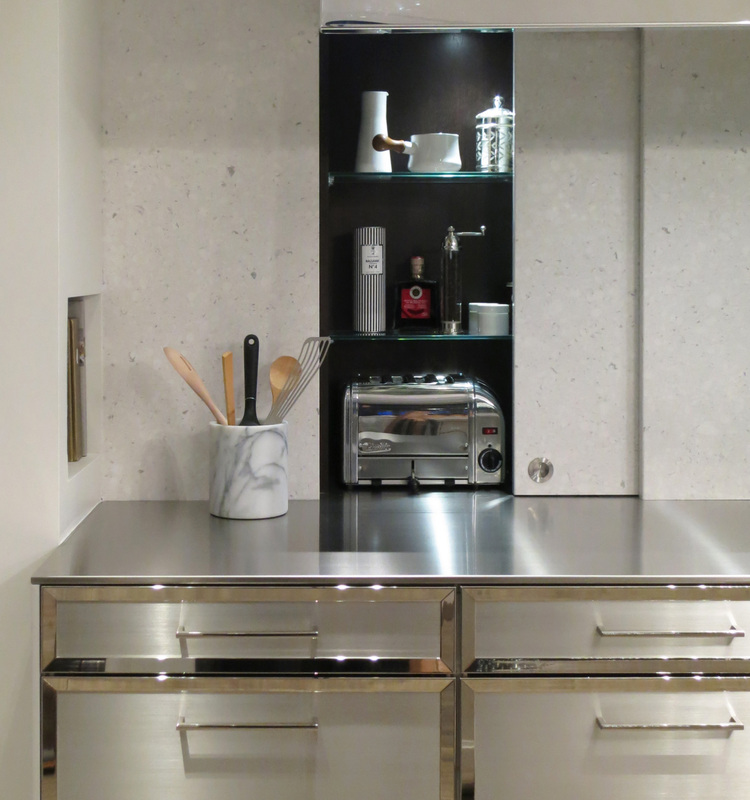 I took some time to carefully place the reflections on the cabinet surfaces to get the right amount of sparkle. This is an area which digital rendering has a good advantage… you just dial up some parameters and you get the look you want. Hand rendering is still a time-efficient process for me, and of course it is very enjoyable. I’m not sure which variation was received best, or if the project is moving ahead. I will update the post if we win the job.